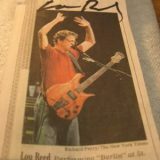 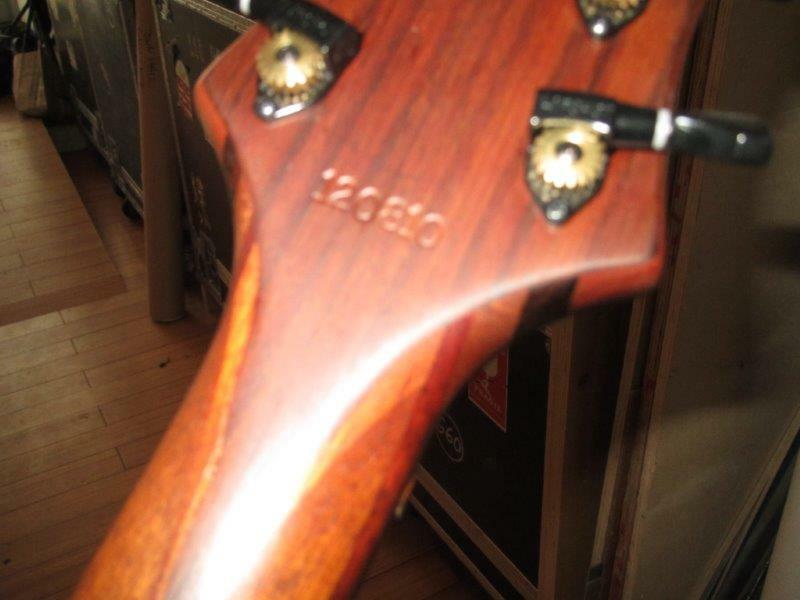 Guitar serial number 12-08-10, one of a series of guitars made for Lou Reed. 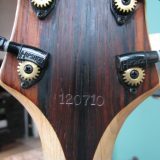 Guitar serial number 12-07-10, one of a series of guitars made for Lou Reed. 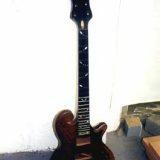 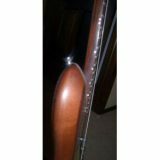 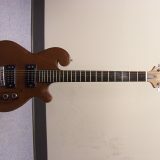 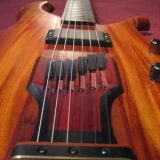 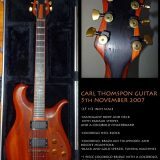 2009 Carl Thompson ball scroll style electric guitar. 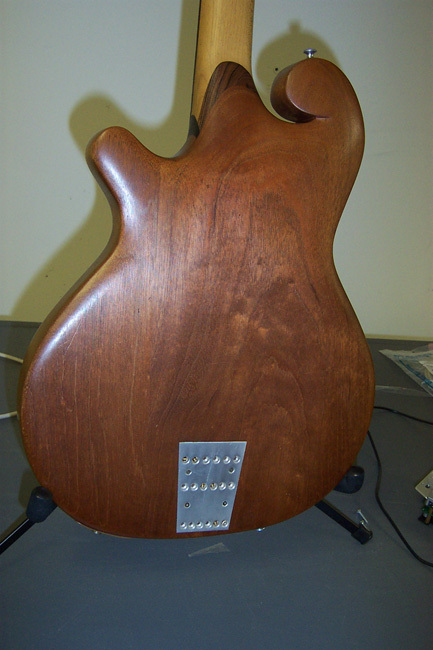 maple, and a reddish brown wood for some accents (mahogany?). 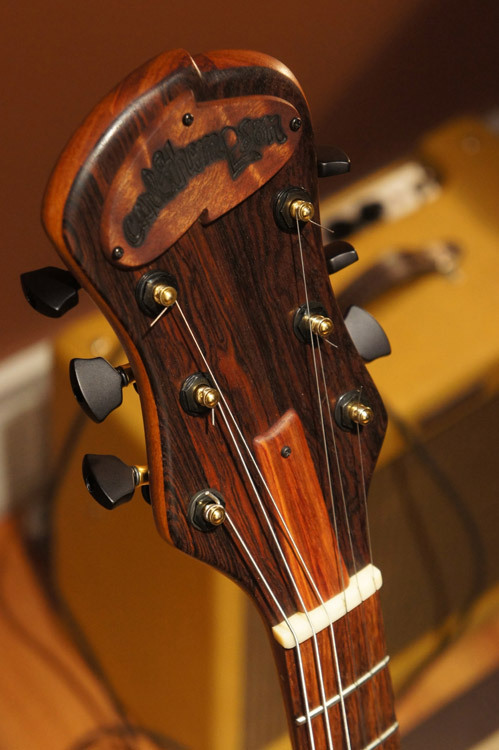 Jet black ebony fingerboard affixed to a exquisitely figured birdseye maple neck. 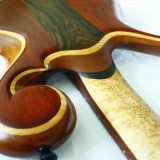 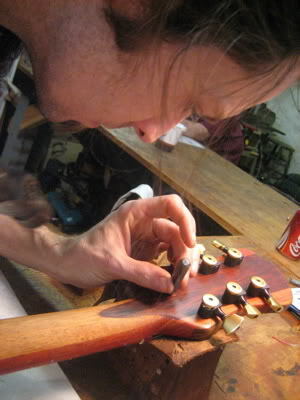 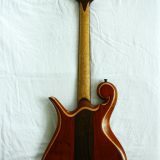 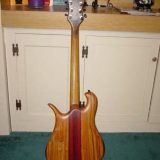 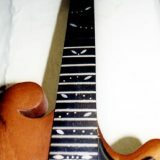 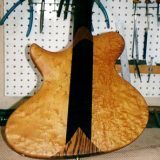 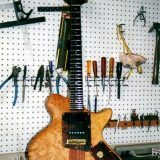 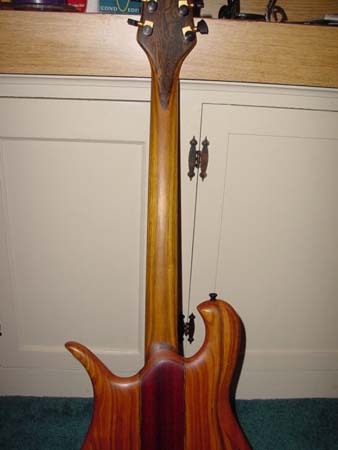 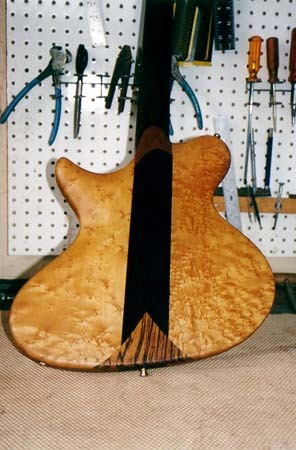 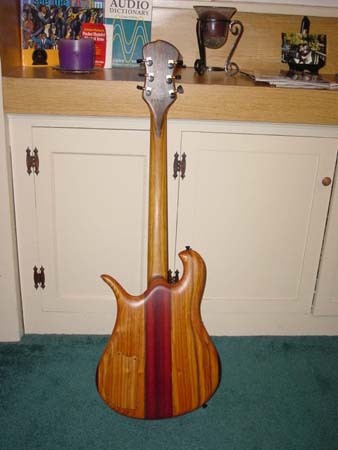 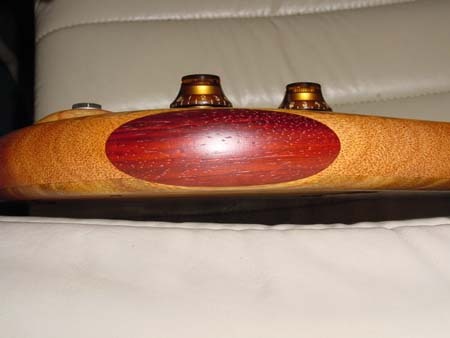 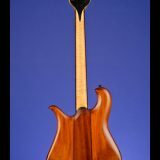 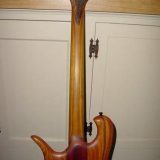 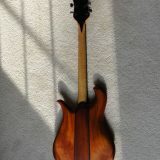 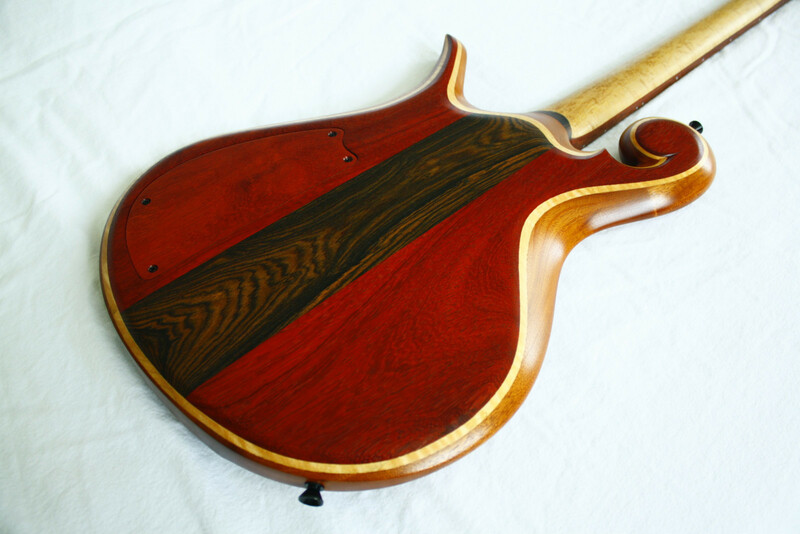 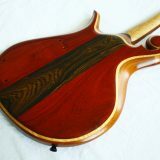 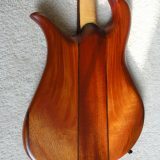 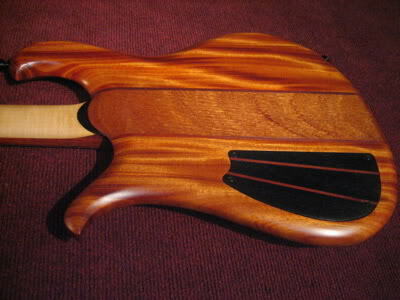 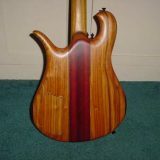 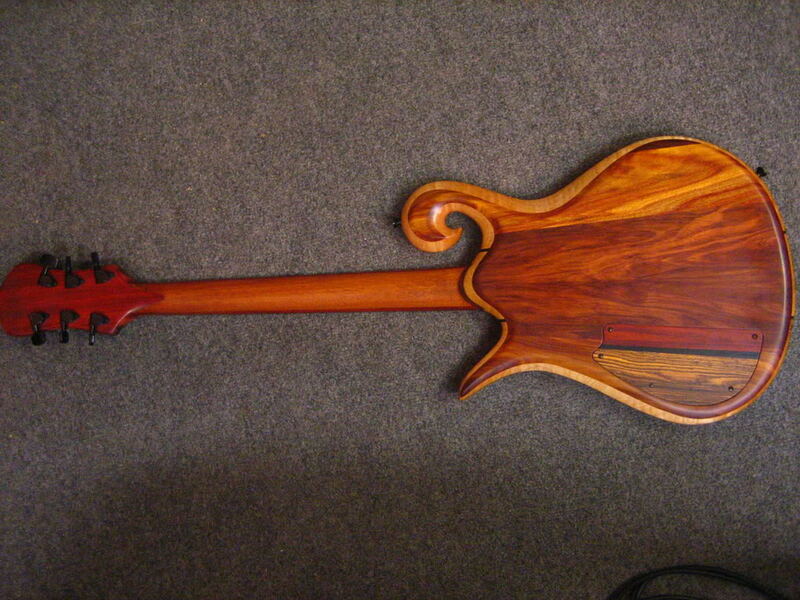 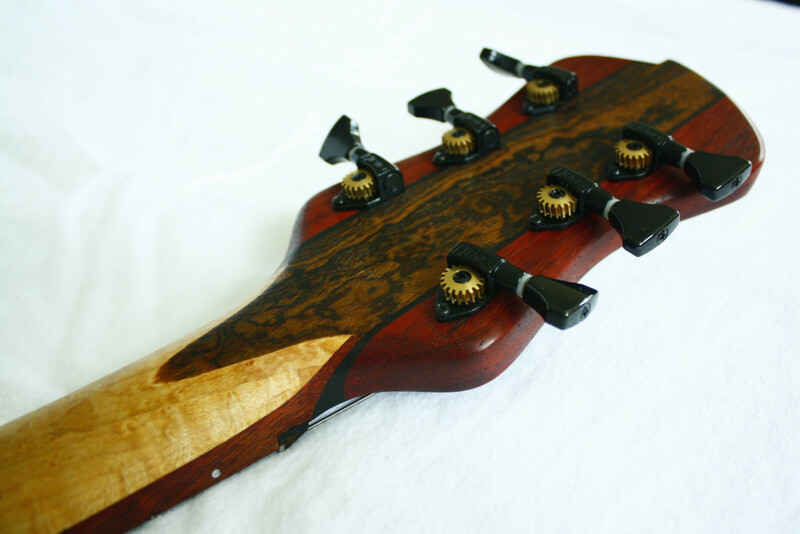 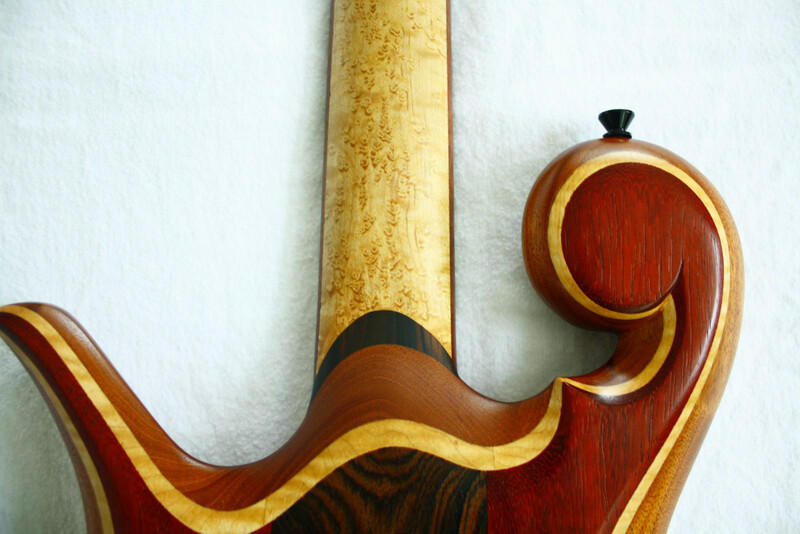 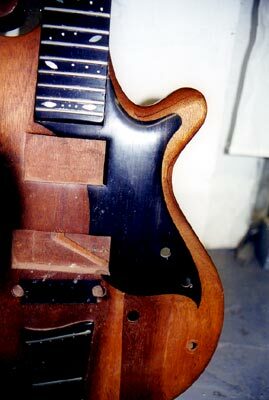 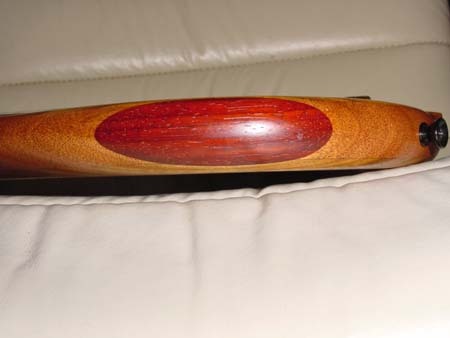 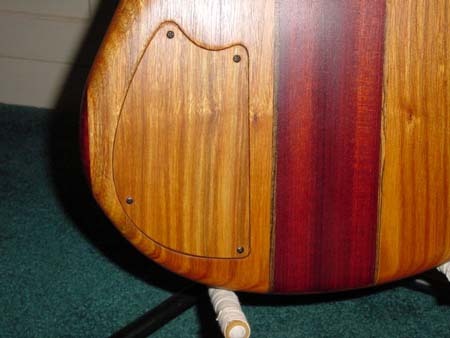 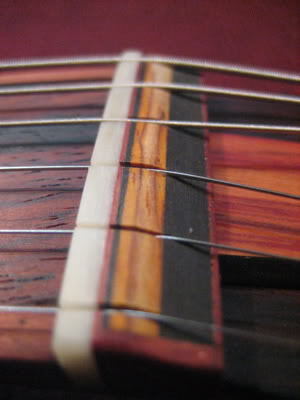 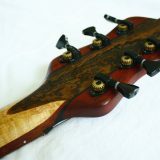 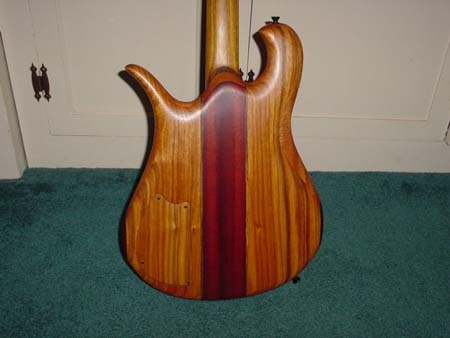 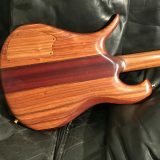 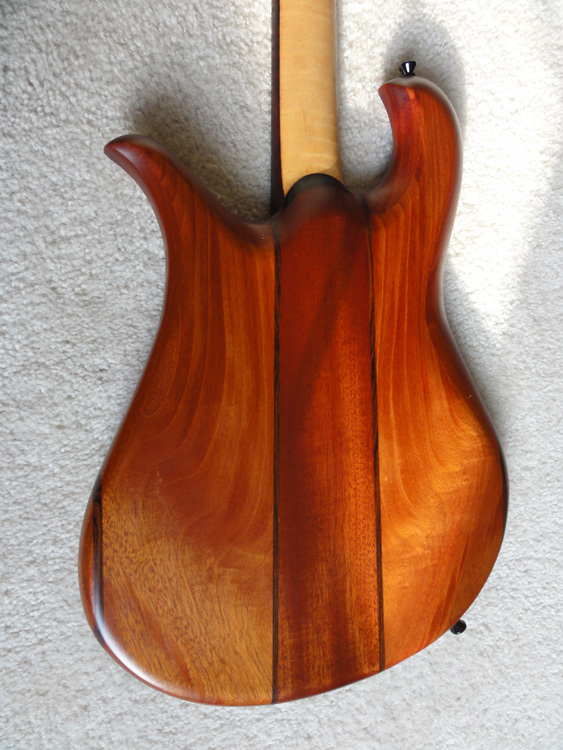 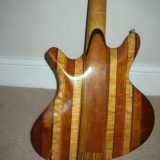 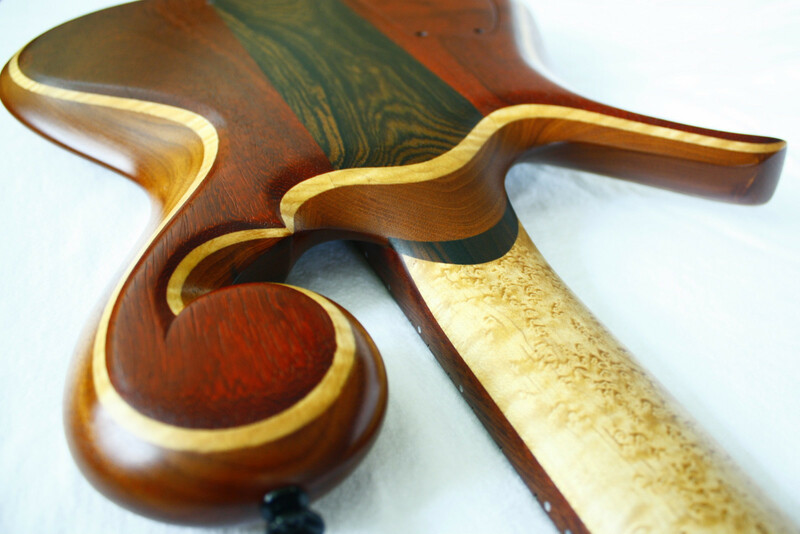 Neck is bound with runners of the same reddish ochre colored accent laminates used on the body. 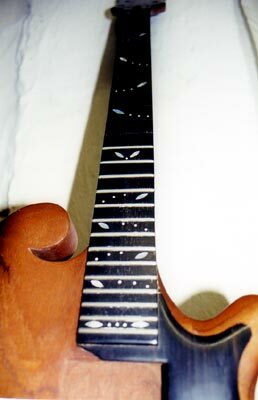 of Carls creation, built from two pieces of bocote and ebony affixed to a shaped brass plate and inlaid with two dots of mother of pearl. 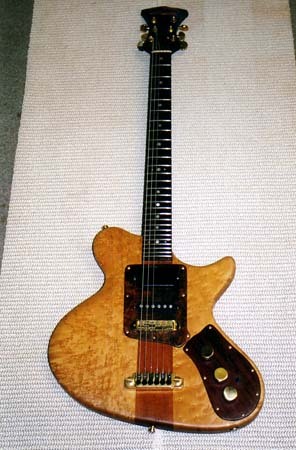 This guitar has a Fender scale length (25.5″) but has a fretboard radius that I believe is closer to a Gibson (perhaps 12?). 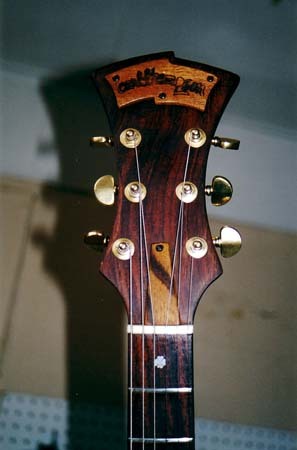 Sargeant Zeno’s guitar, serial number 2-7-08. 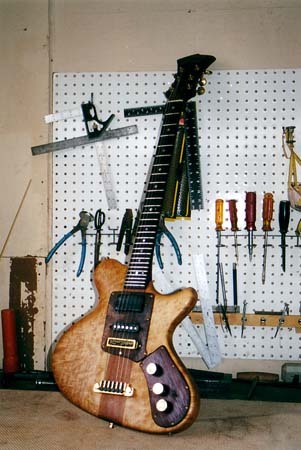 Guitar serial number 5-25-07, one of a series of guitars made for Lou Reed. 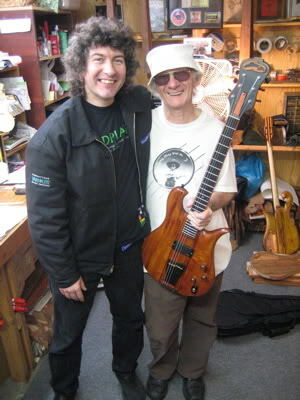 Carl is pictured with Stuart, Lou Reed’s guitar tech. 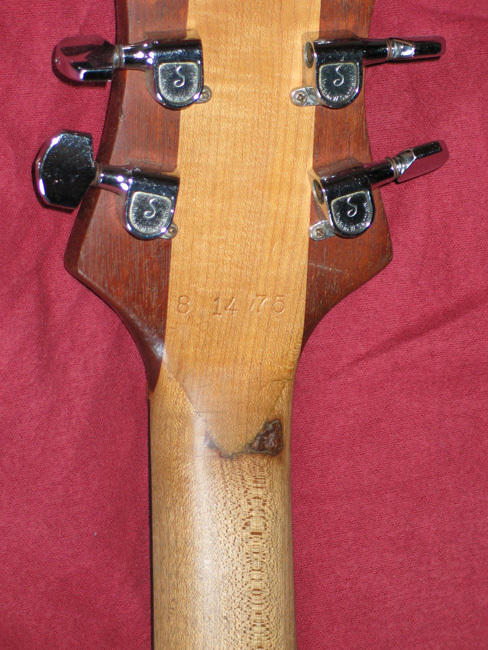 Also pictured is serial number 5-11-07. 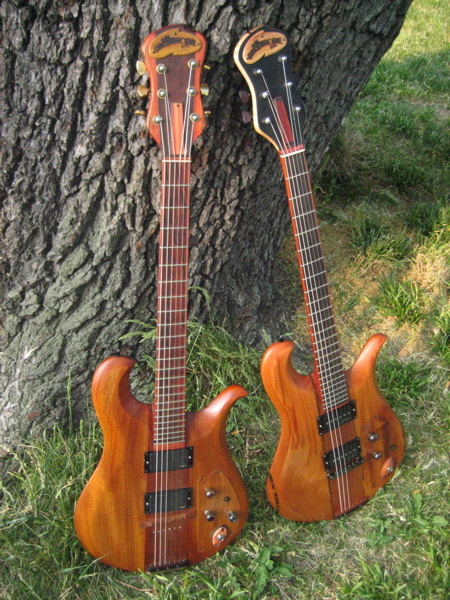 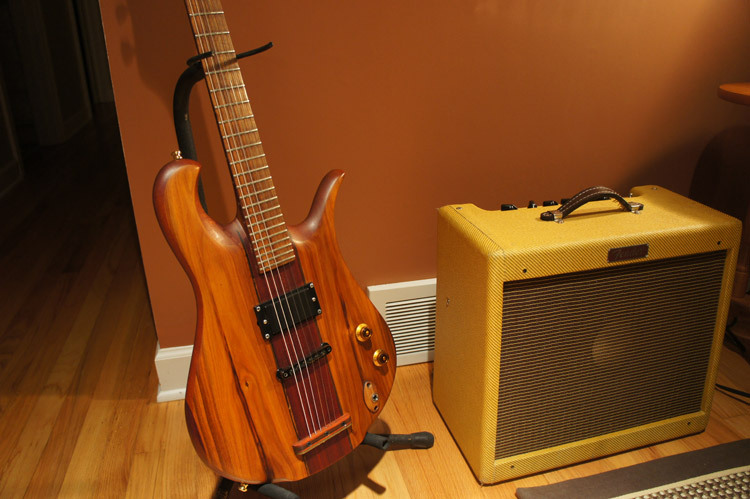 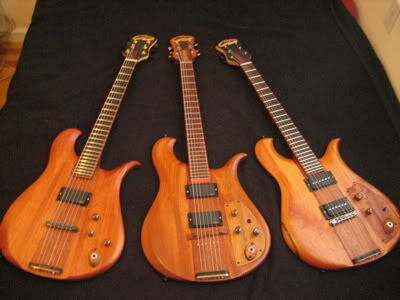 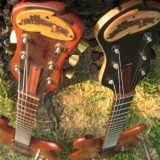 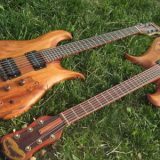 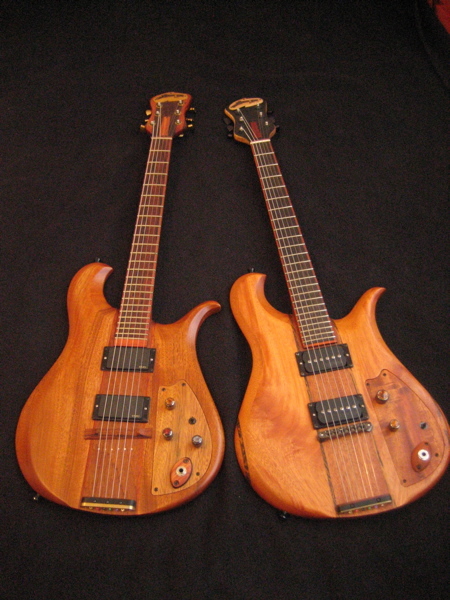 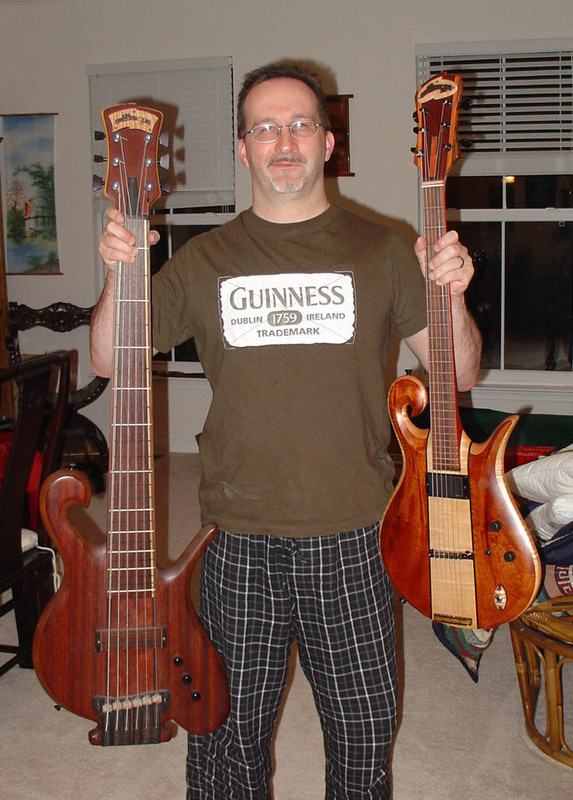 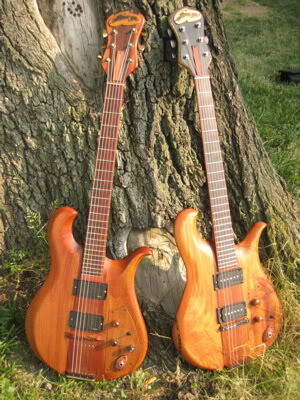 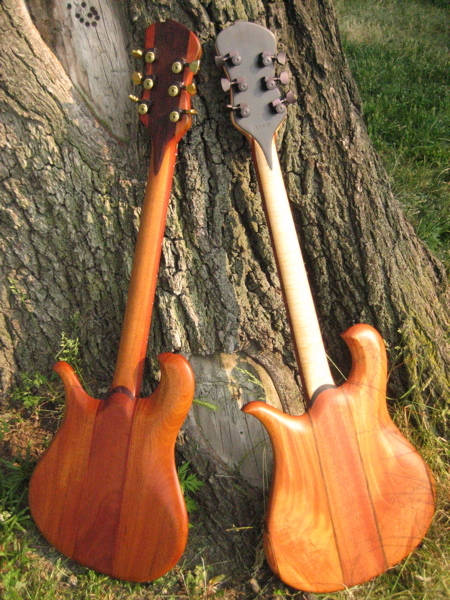 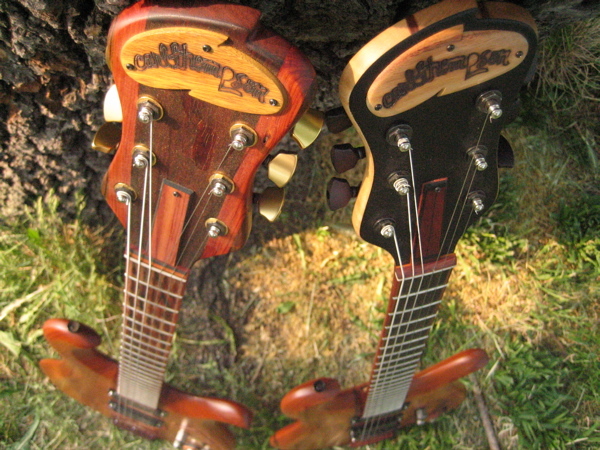 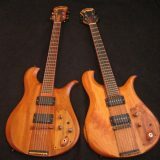 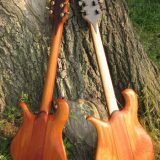 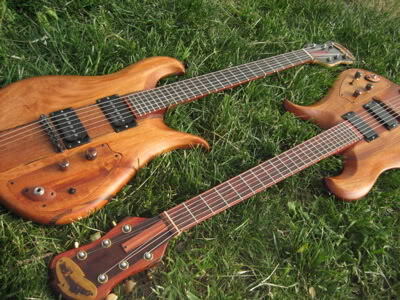 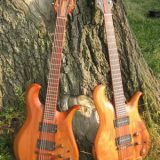 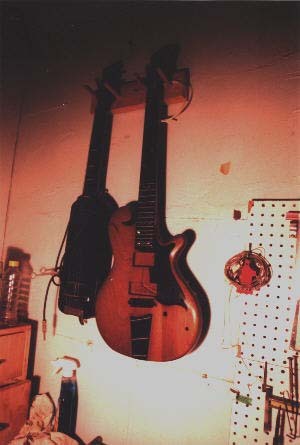 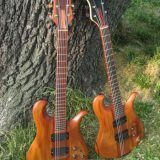 A pair of guitars built around 2007. 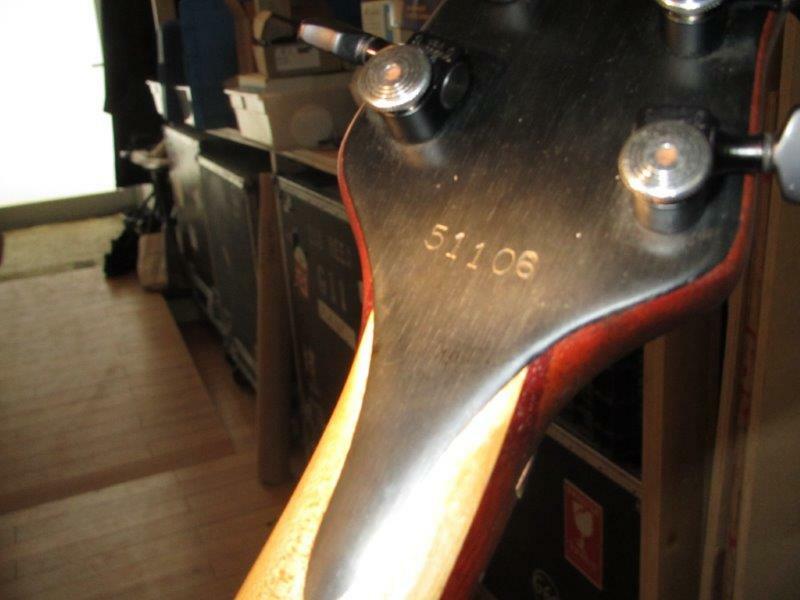 Guitar serial number 5-11-06, one of a series of guitars made for Lou Reed. 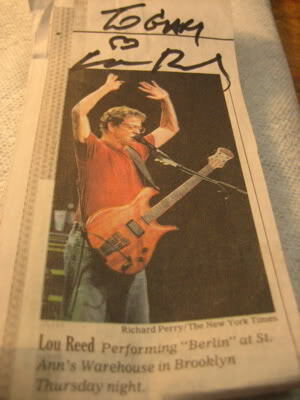 This is the absolute rarest of rarities. 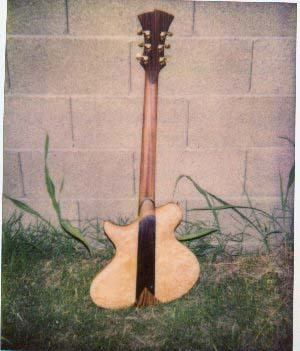 This is the one, the only, the extremely unique Carl Thompson acoustic guitar. 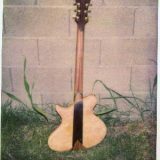 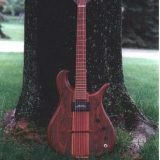 This guitar, serial # 4-20-02, has a Canary neck with a Redheart stripe under the Canary fretboard. 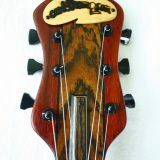 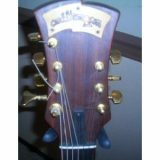 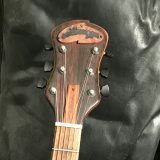 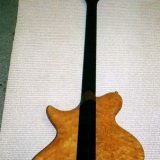 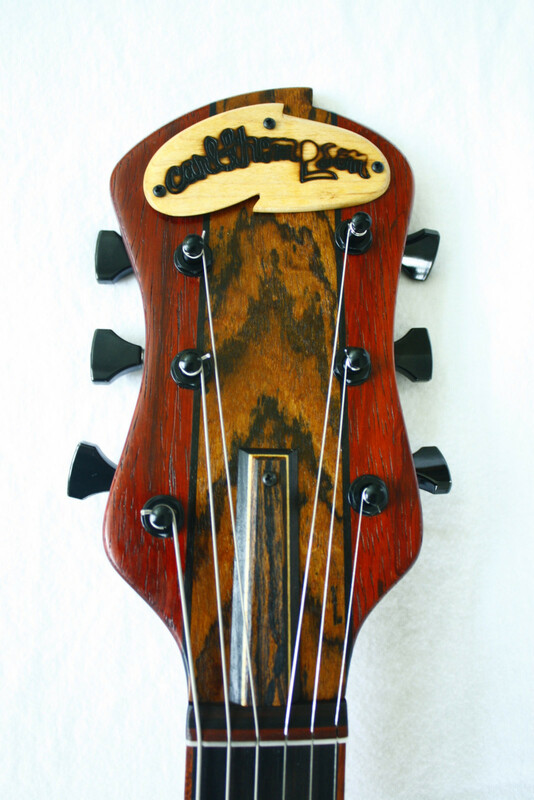 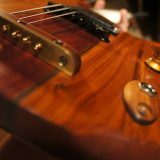 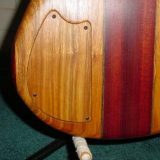 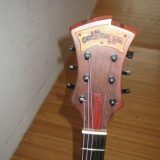 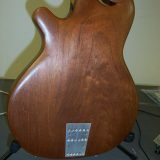 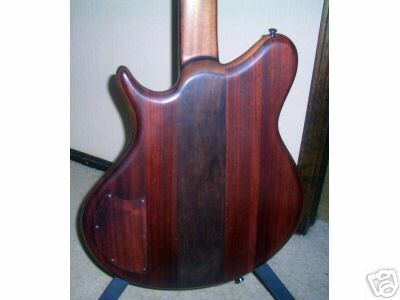 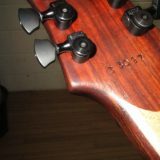 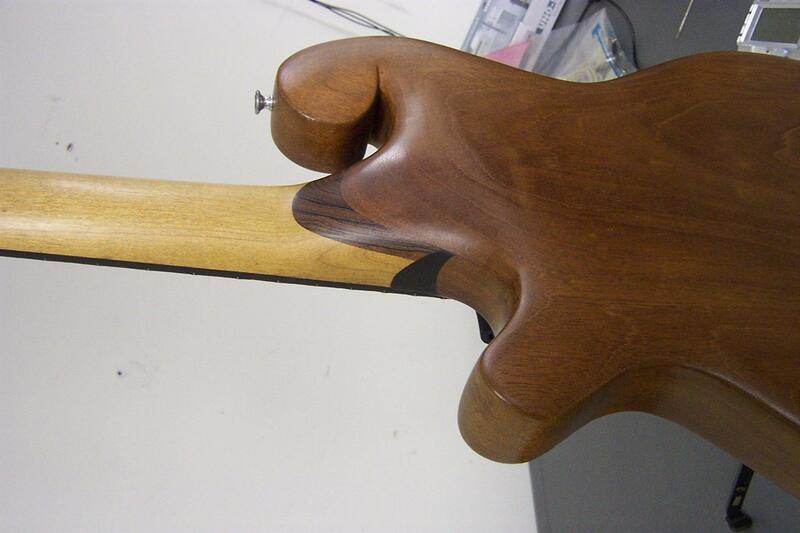 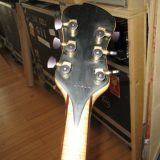 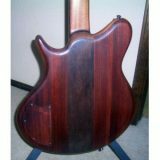 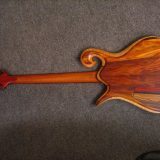 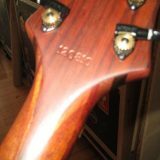 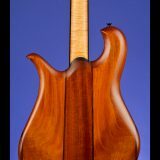 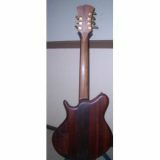 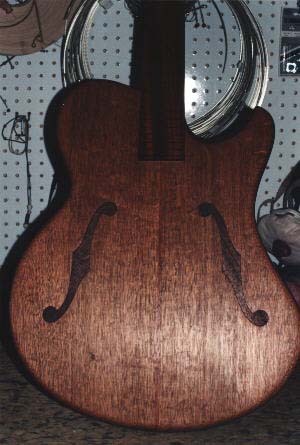 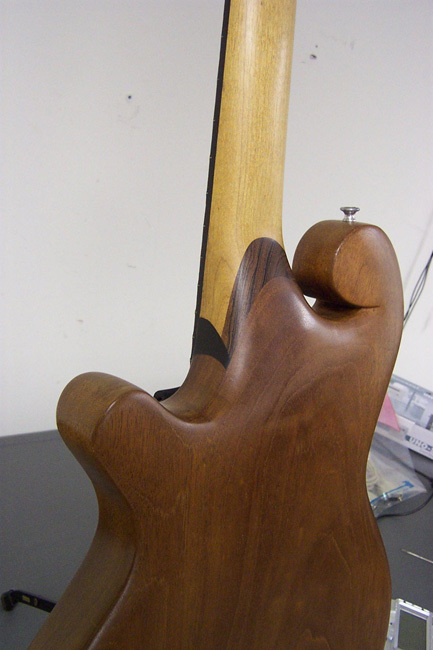 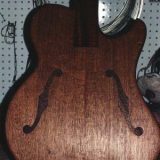 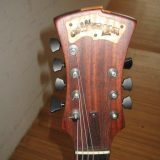 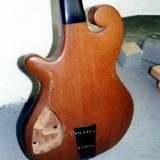 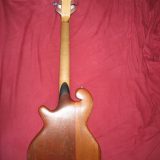 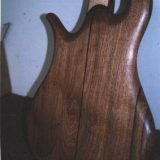 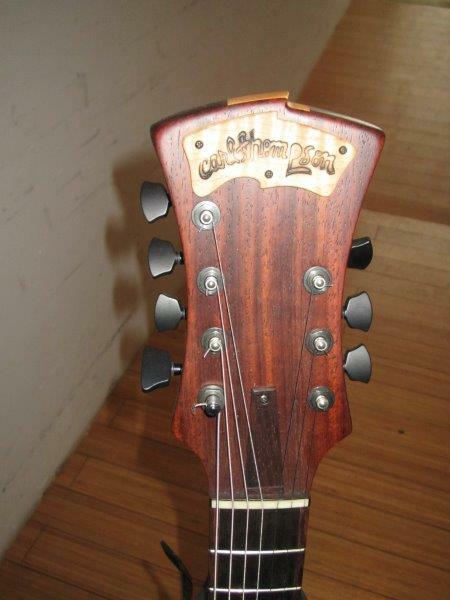 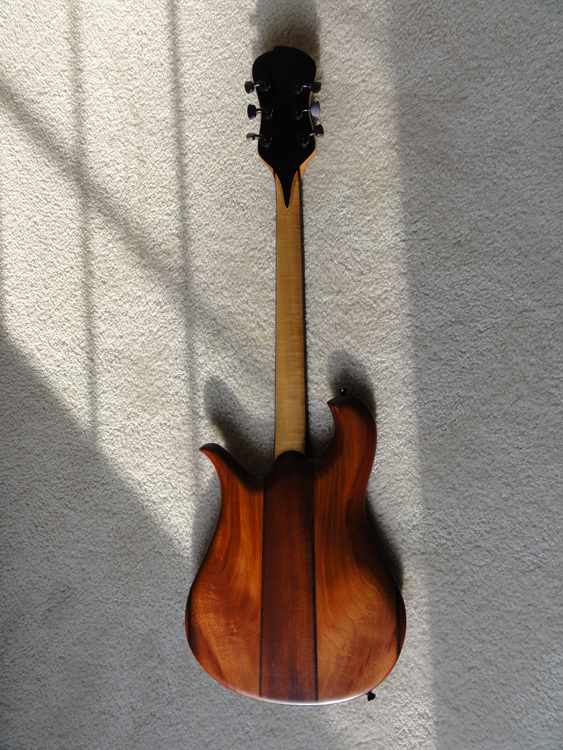 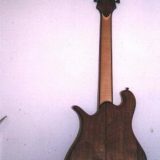 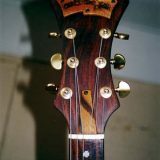 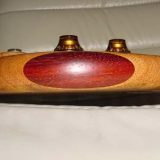 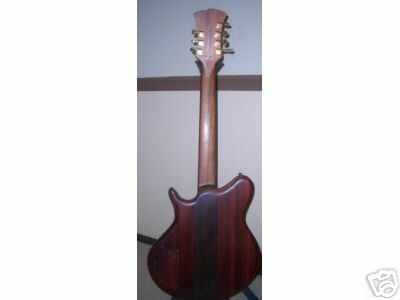 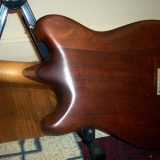 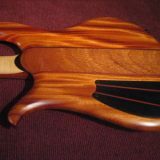 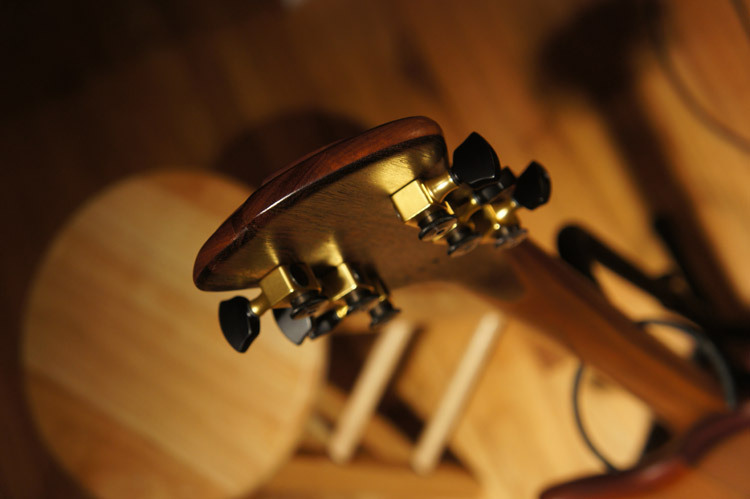 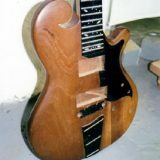 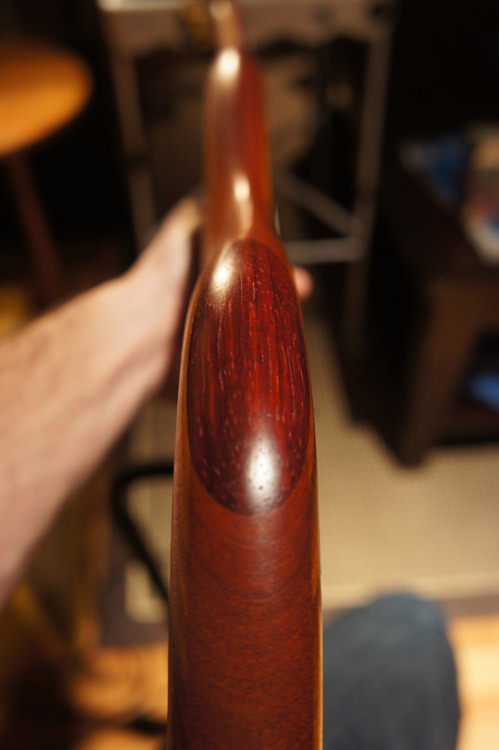 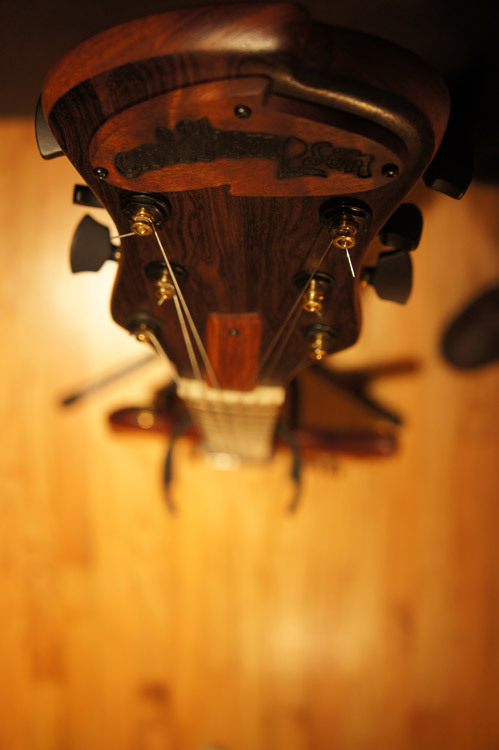 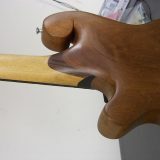 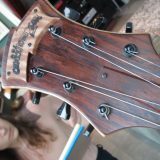 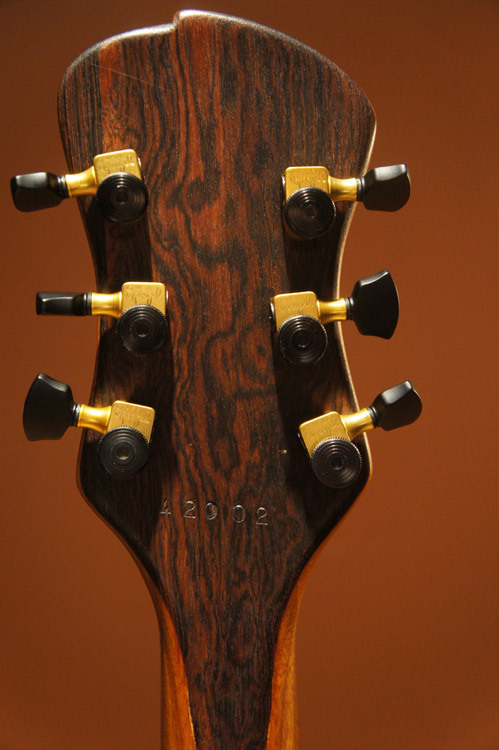 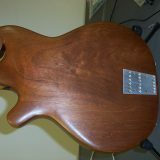 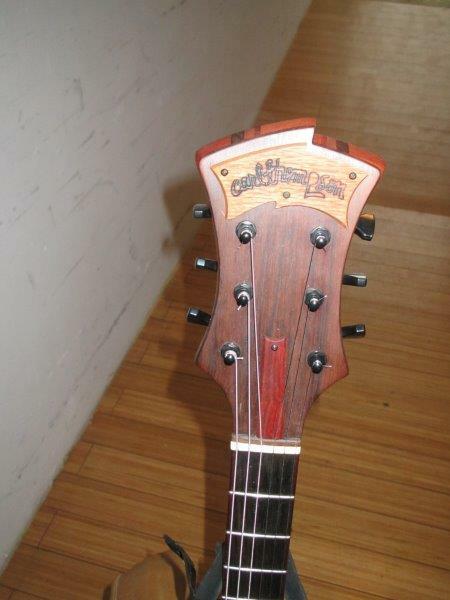 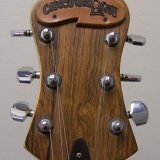 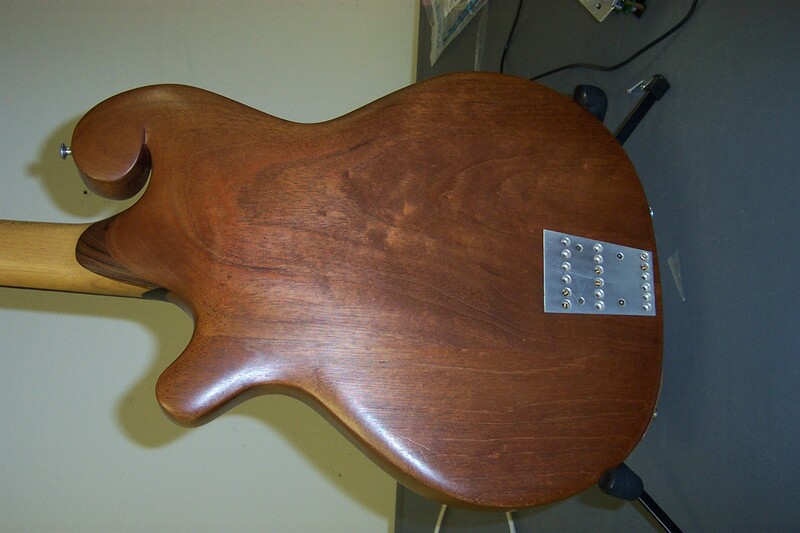 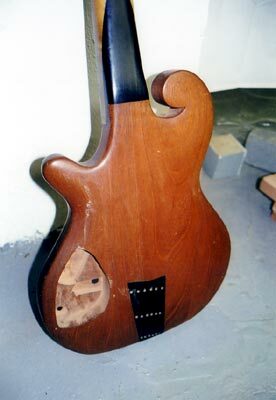 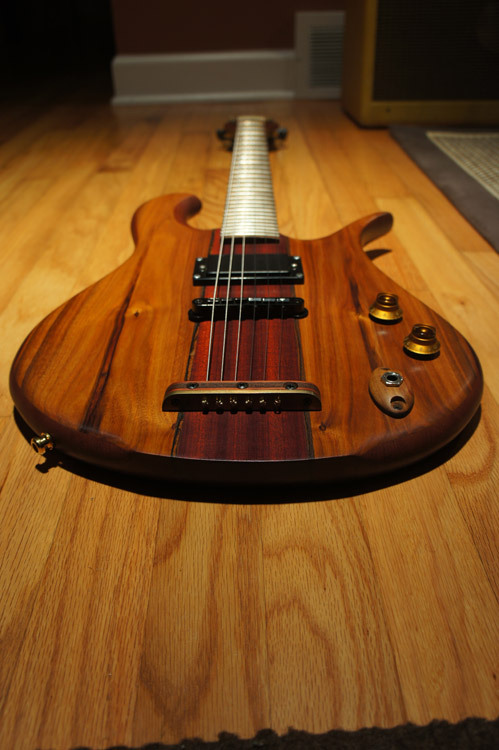 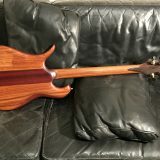 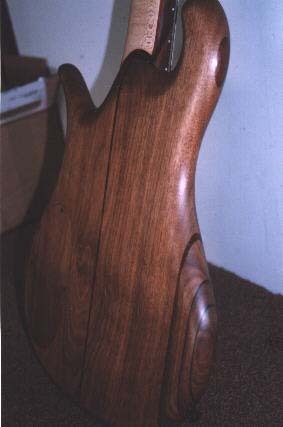 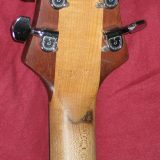 The body is Mahogany with a Canary top, back, and headstock. 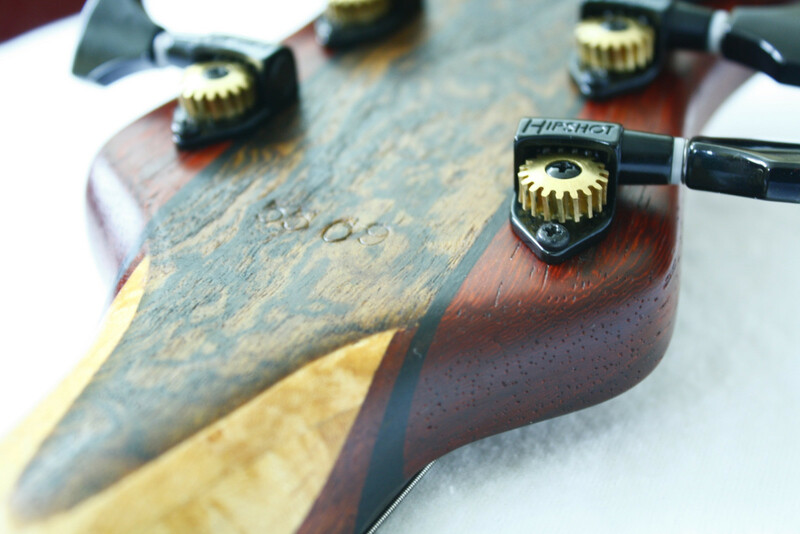 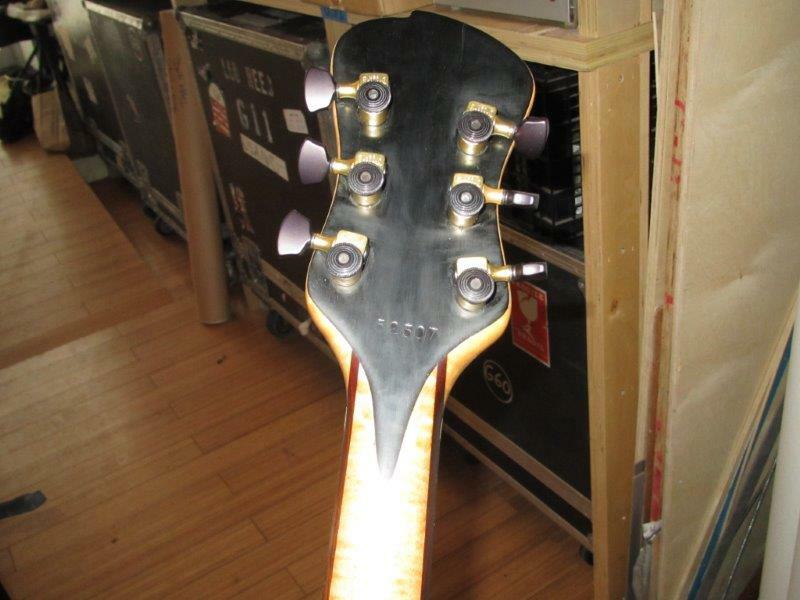 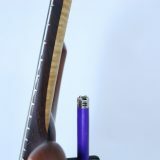 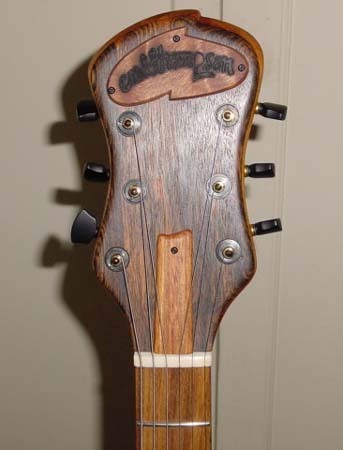 There’s a Bocote veneer on the headstock as well. 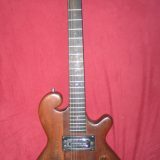 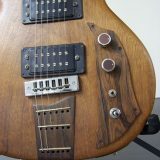 The guitar also features 1 Kent Armstrong humbucker, bone nut, black tune-o-matic bridge, wood tailpiece, dunlop 6000 frets, 1 volume and 1 tone knob. 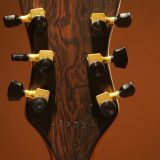 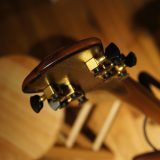 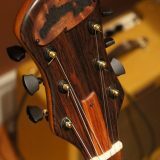 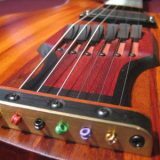 The sperzel tuning machines are made from a black set and a gold set and they really complement the guitar’s color scheme. 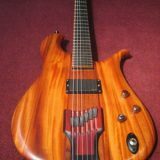 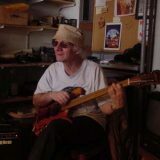 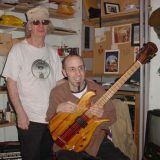 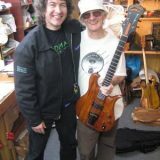 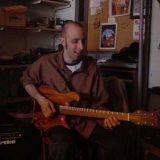 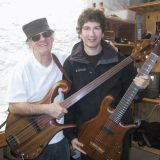 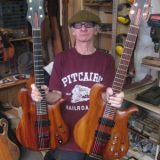 Chris Bouno ordered the guitar in February of 1999 on a recommendation from his teacher, Gerry Carboy, the proud owner of a bass he bought from Carl in the 70’s and still plays today. 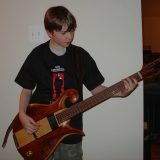 Magnus Kunow now owns the guitar. 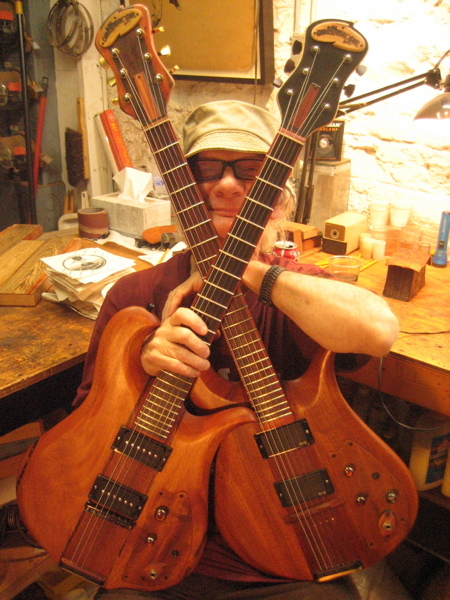 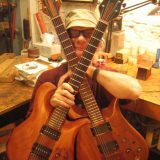 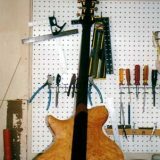 A 7 string guitar in the works for jazz legend Howie Collins. 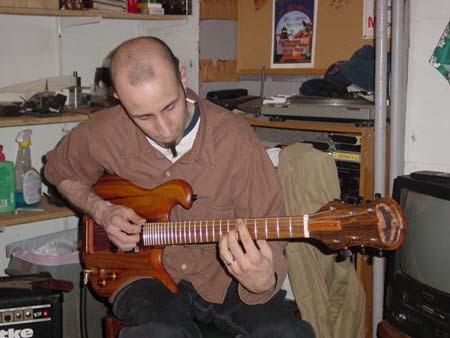 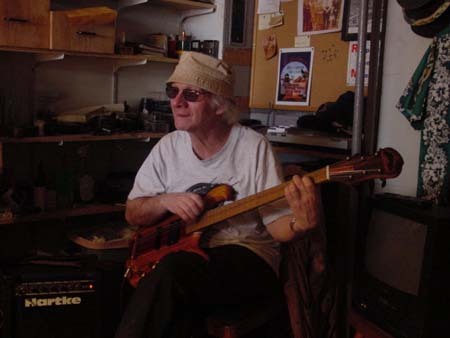 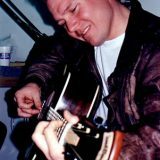 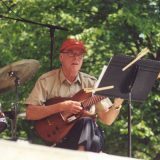 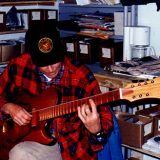 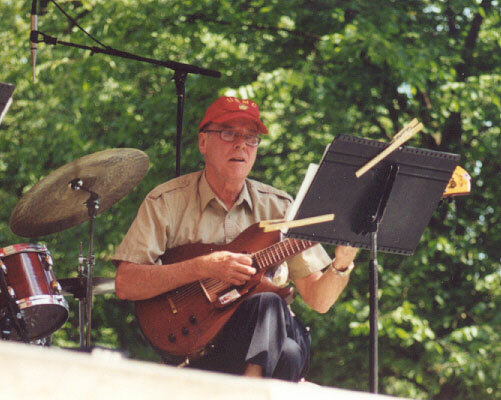 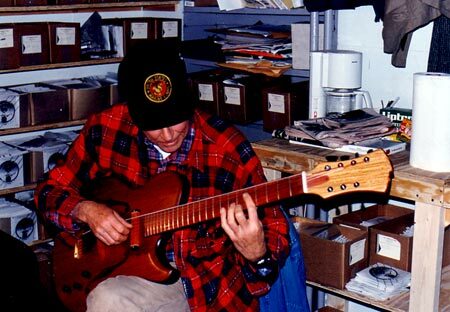 Also pictured: Howie Collins playing the guitar at the Delaware Water Gap, PA Jazz Fest in September 2001, Photo courtesy of Dan Jackson, and Howie at the shop. 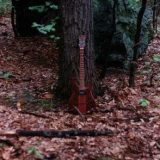 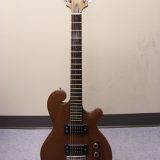 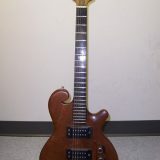 A guitar made in the early 2000s. 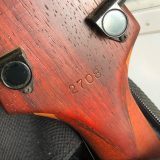 Sean L. Geoghegan sent this information and the pictures that follow. 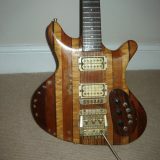 Guitar serial number 3-30-97, one of a series of guitars made for Lou Reed. 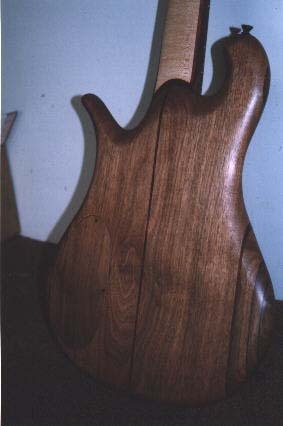 It has a walnut body trimmed with cocabola. 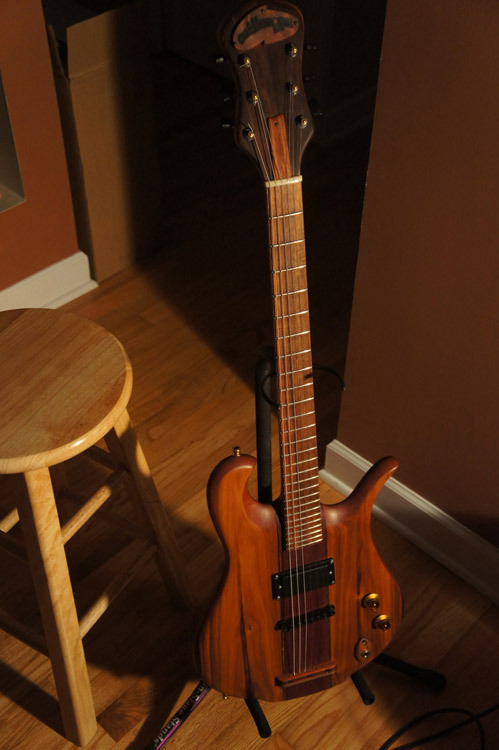 It also has a maple neck and an ebony fretboard. 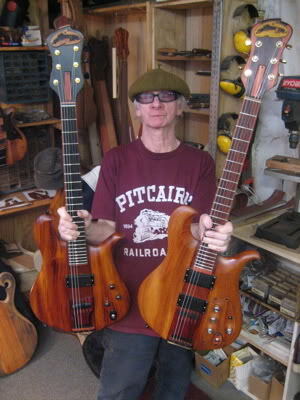 Also pictured is Steward Hurwood. 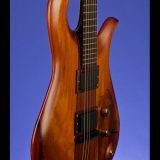 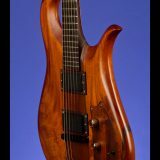 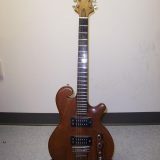 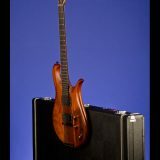 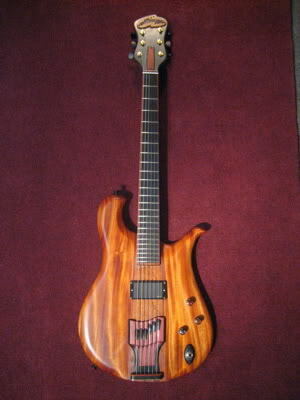 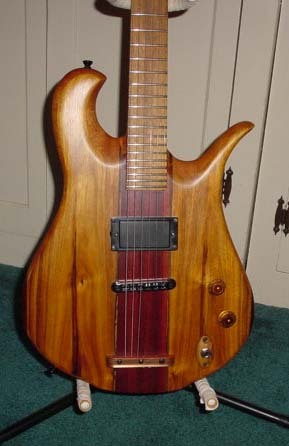 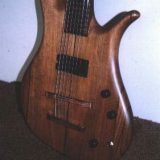 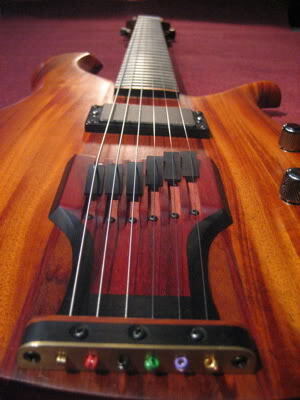 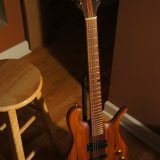 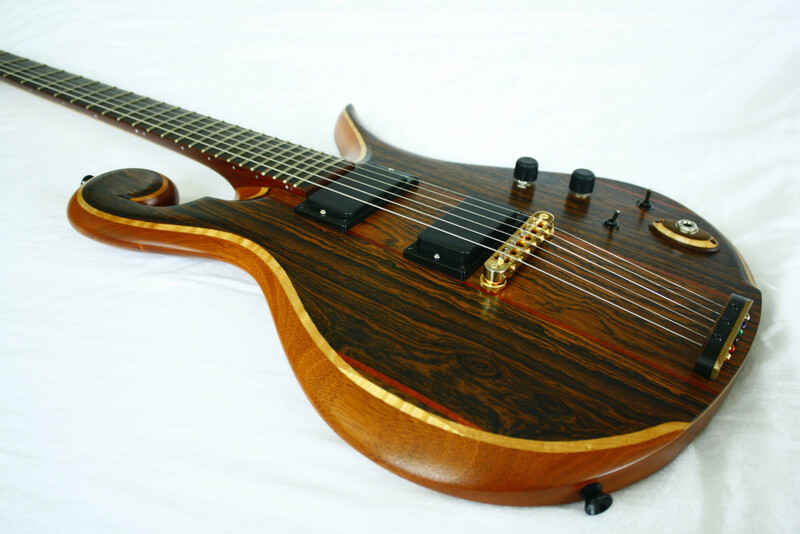 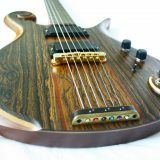 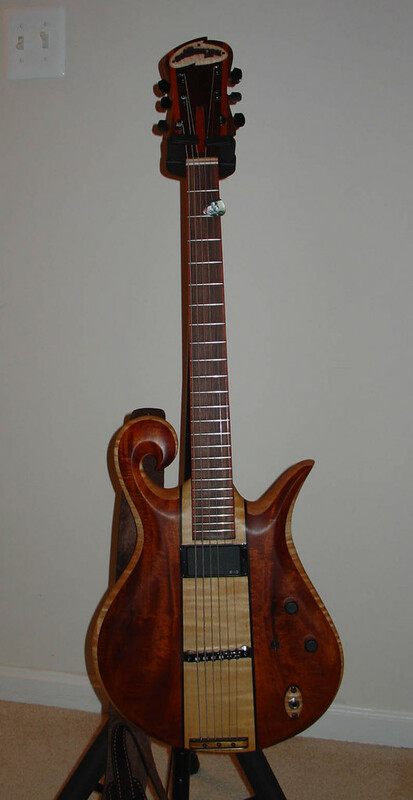 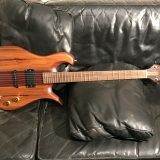 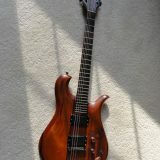 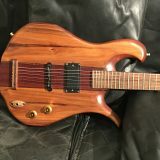 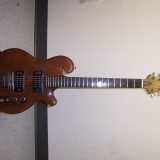 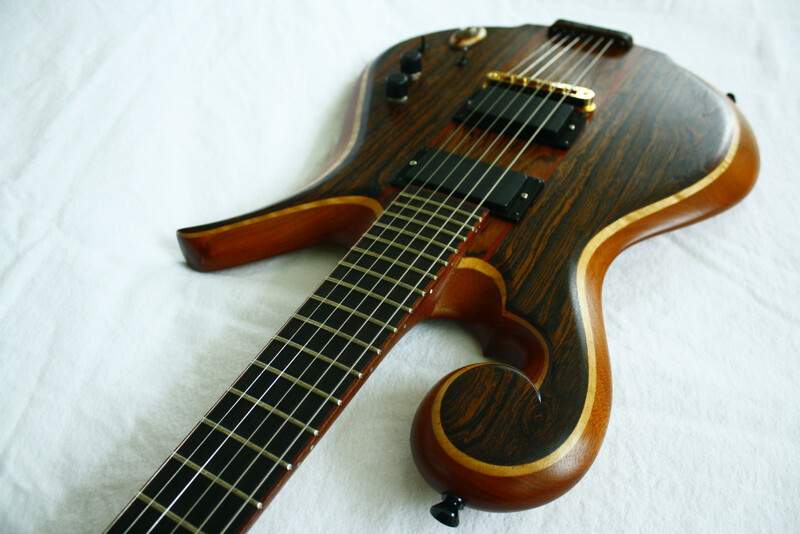 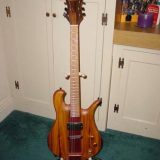 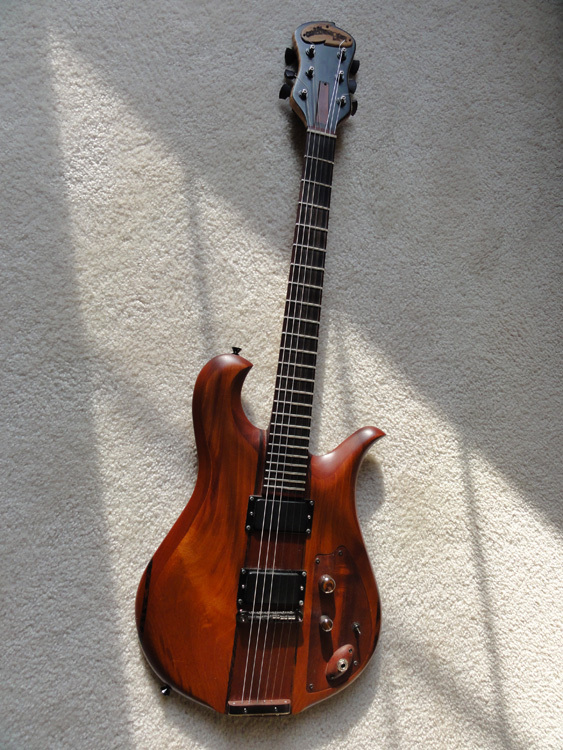 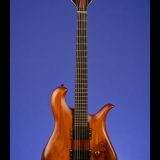 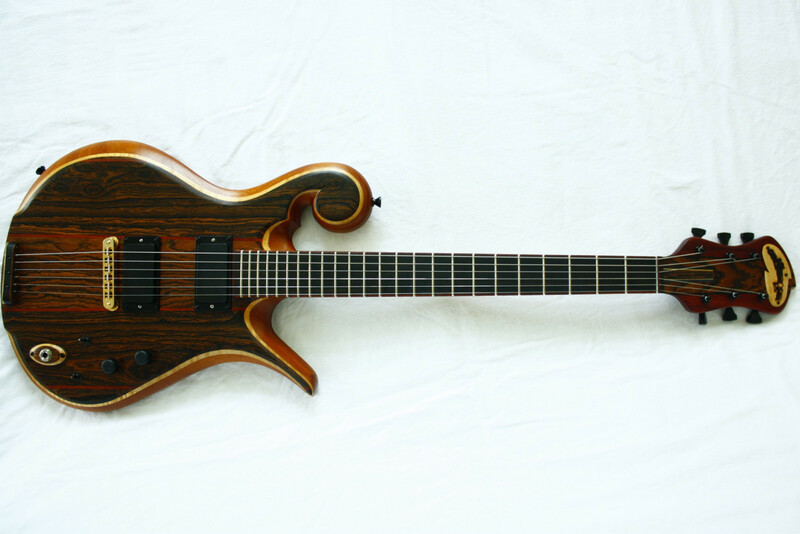 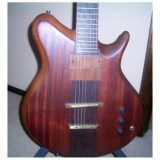 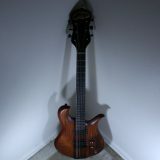 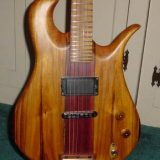 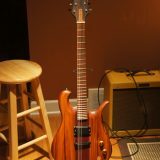 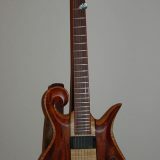 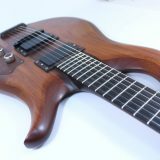 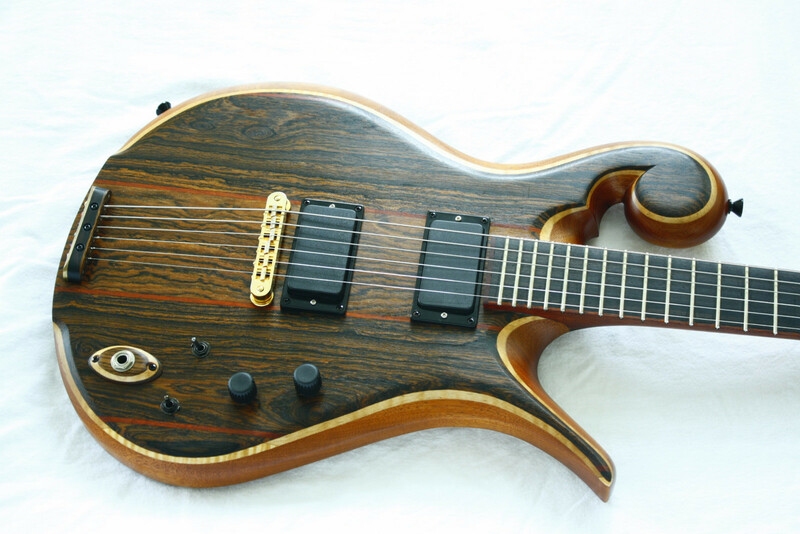 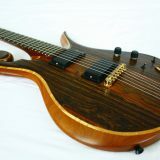 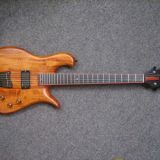 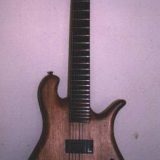 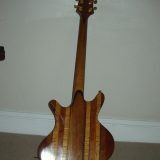 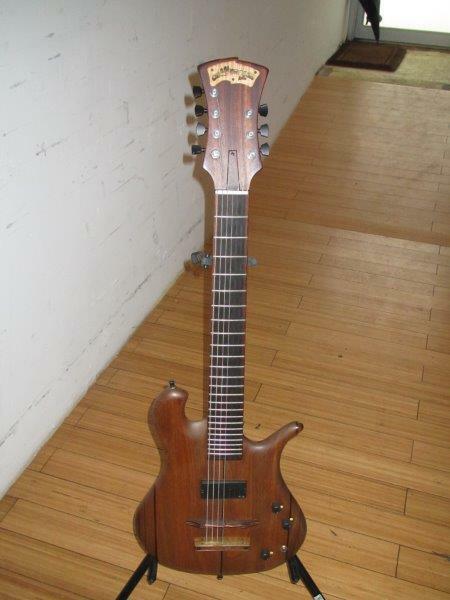 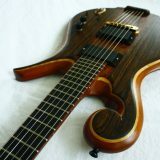 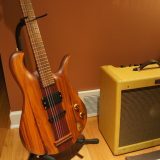 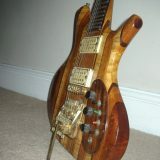 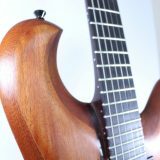 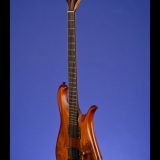 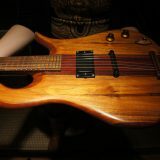 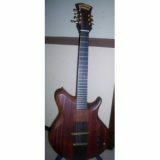 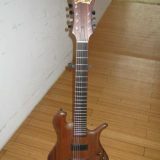 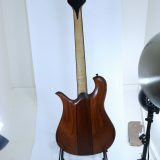 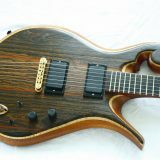 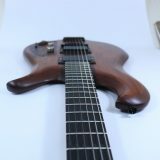 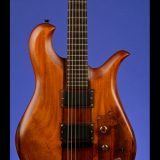 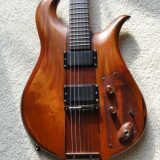 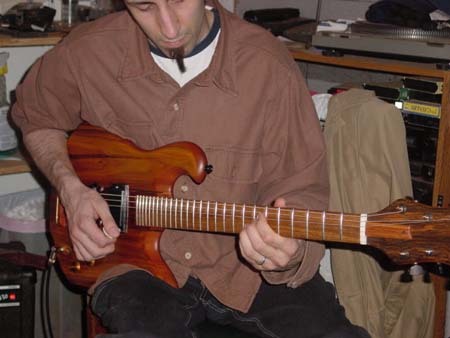 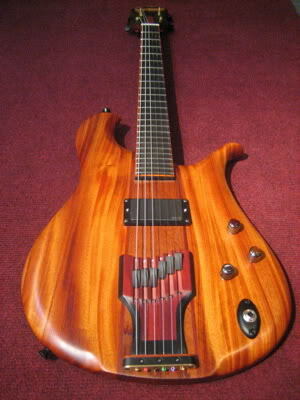 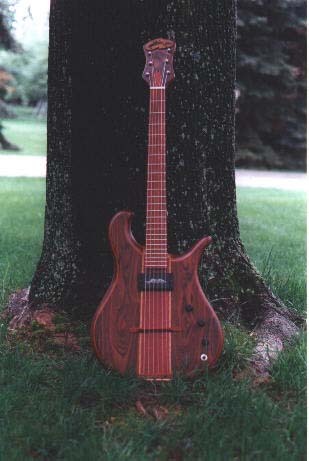 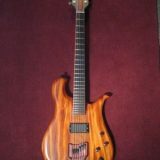 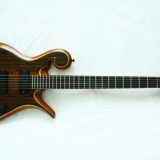 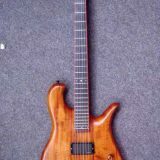 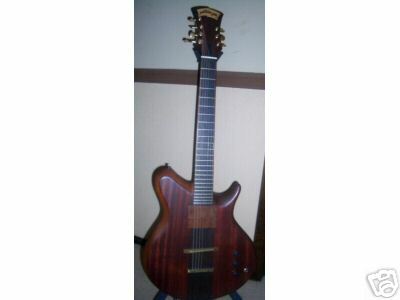 Another 7 String CT guitar, this one has a mahogany front, walnut back, and cocobola overlays. 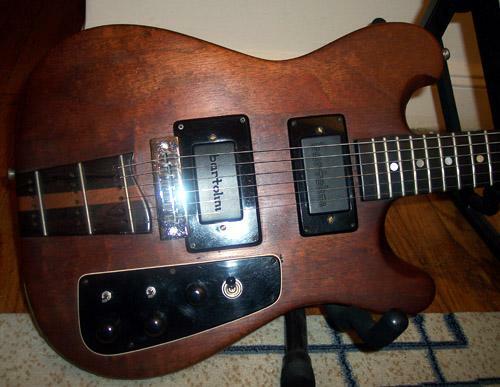 It also has a single EMG. 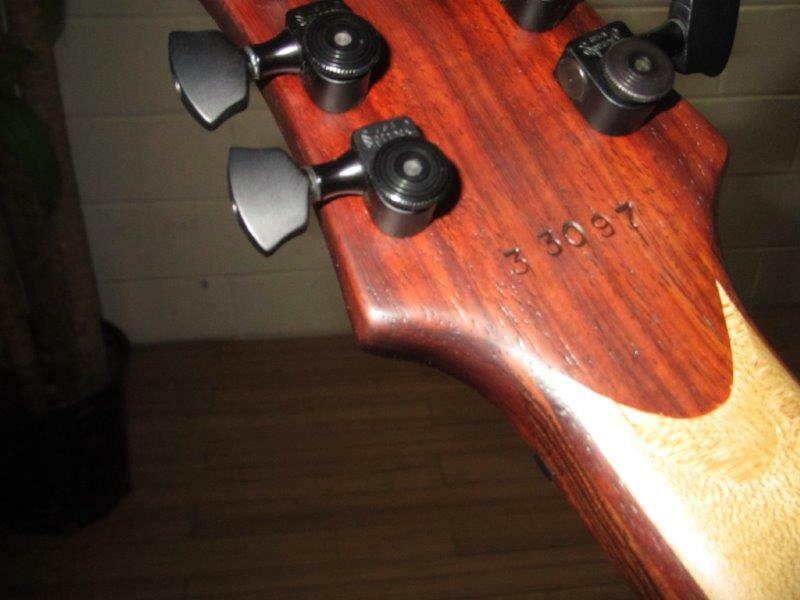 The serial # is 12994. 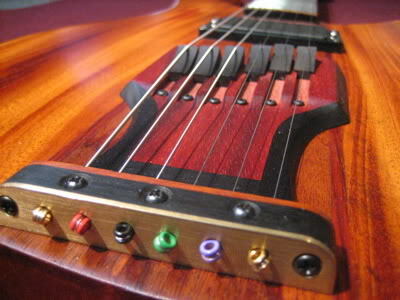 It is difficult to say definitively, but it appears as though the rainbow guitar has resurfaced. 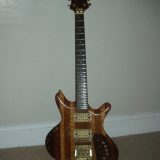 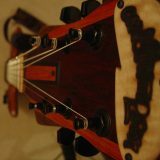 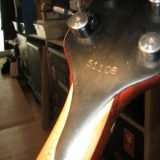 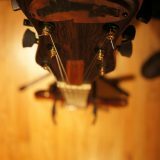 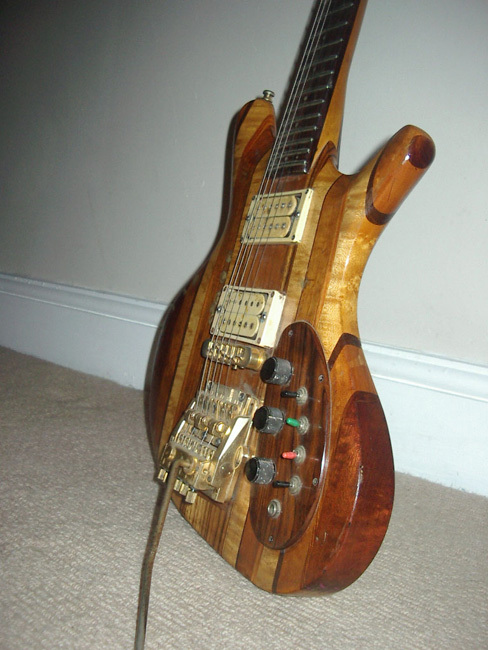 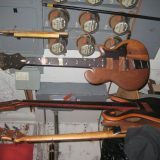 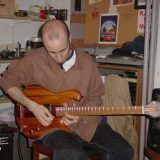 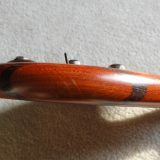 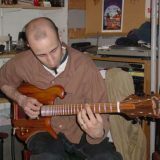 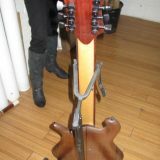 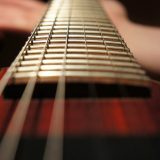 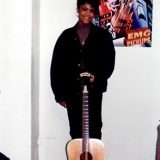 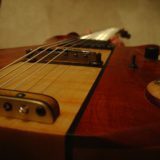 Mik sent in the following photos of a guitar he rescued just over 10 years ago from a London recording studio. 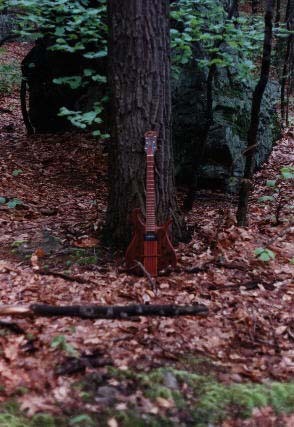 Amazingly the guitar had been abandoned there! 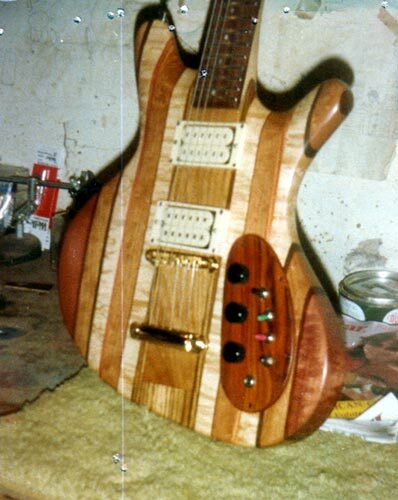 It isn’t clear whether Carl made more than one, but my guess is that this is the same guitar that inspired the Les Claypool rainbow bass. 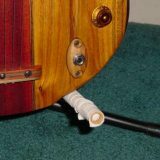 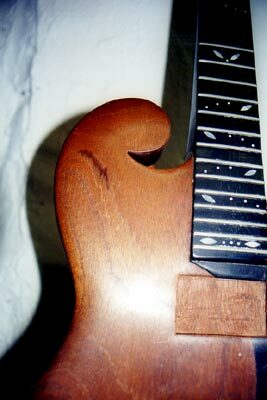 Over the years it looks like people have drilled holes, slapped a Washburn tremolo on it and generally abused this piece of history. 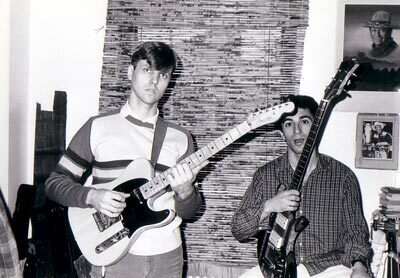 Also pictured are Ken Hatfield and Billy Essex. 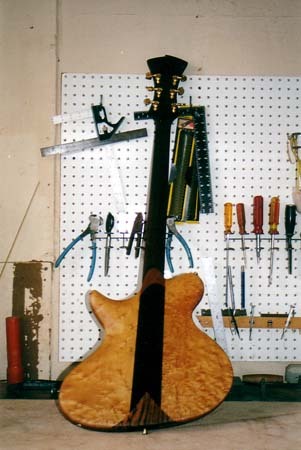 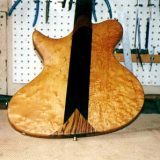 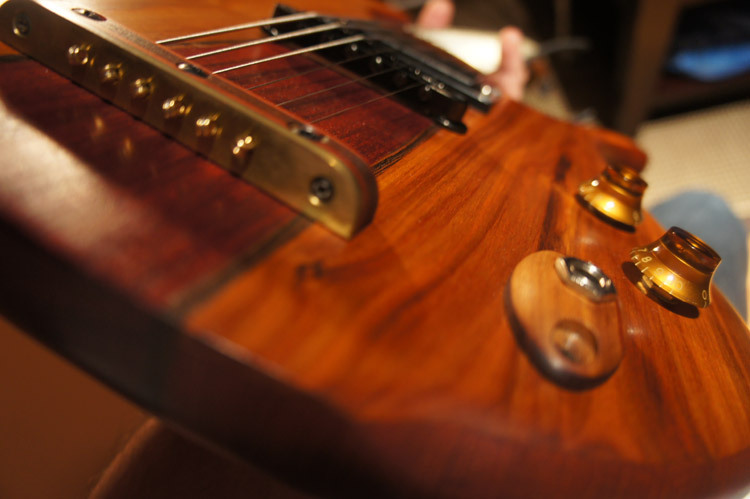 This Birdseye Maple guitar was originally made for Mark Manley. 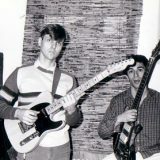 It is serial # 9-7-77. 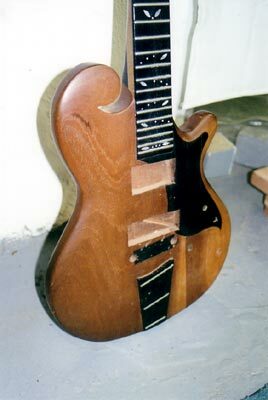 It has since been converted to Baritone tuning. 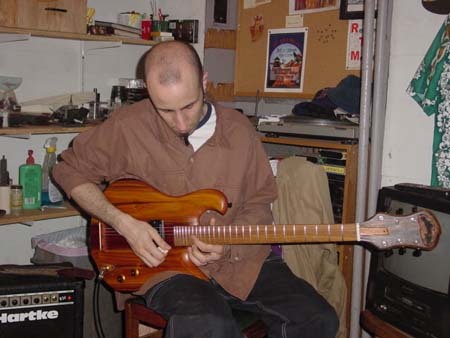 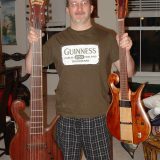 The guitar is now owned by a gentleman named Shahzad, who recently received an 8-string bass from Carl. 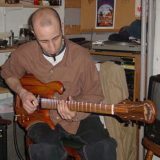 Shahzad purchased the guitar in Arizona but has recently moved to the Brooklyn area and brought the guitar back to the shop for Carl to clean it up. 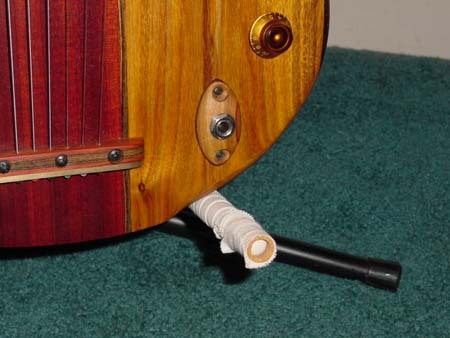 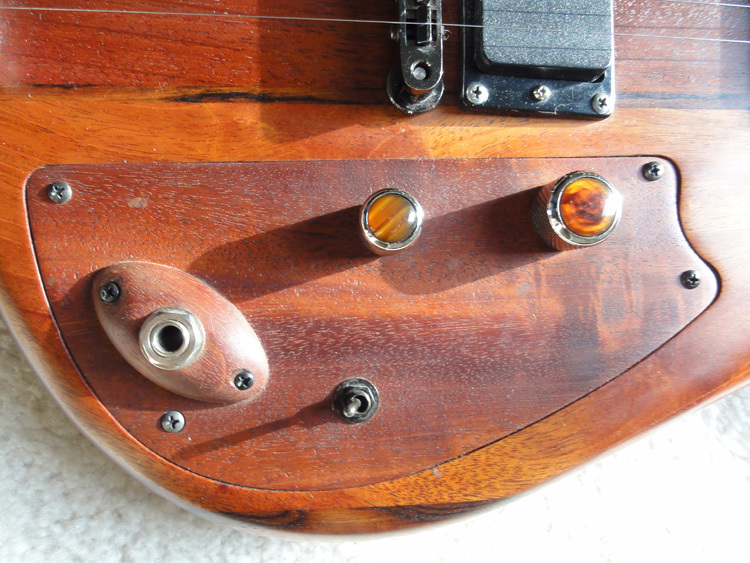 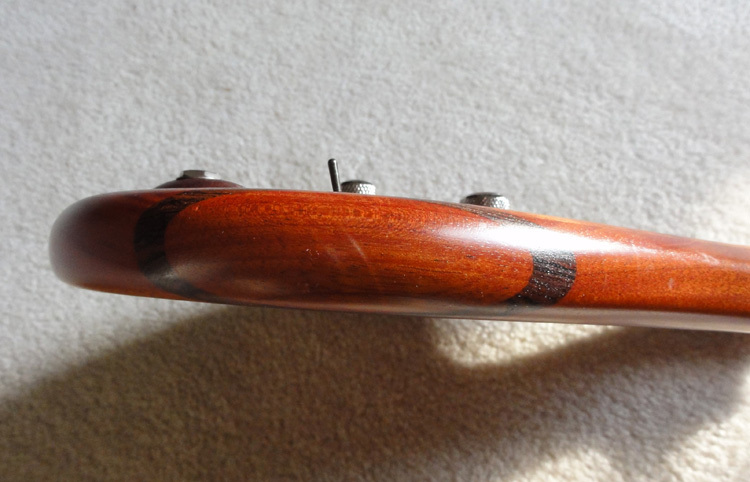 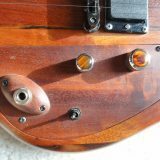 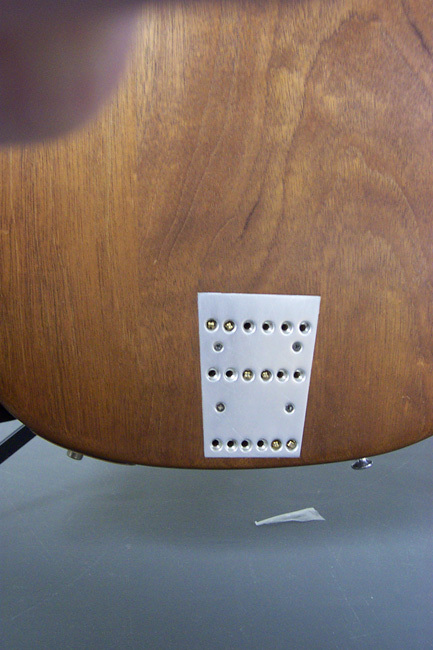 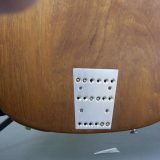 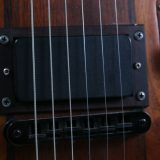 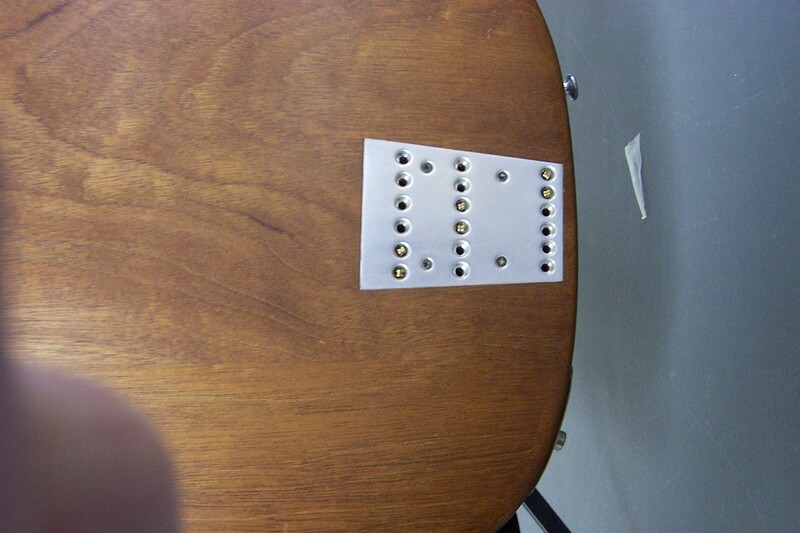 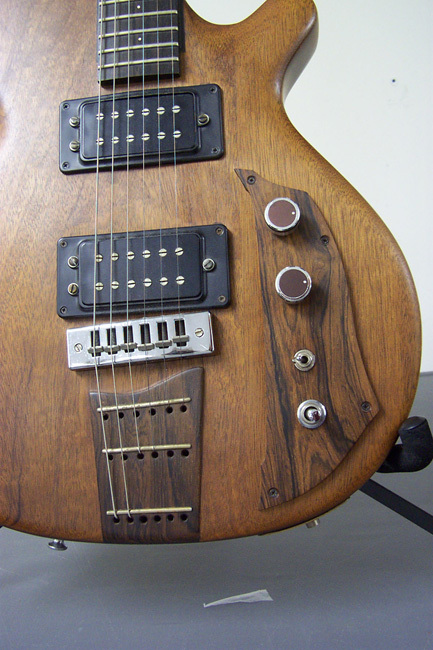 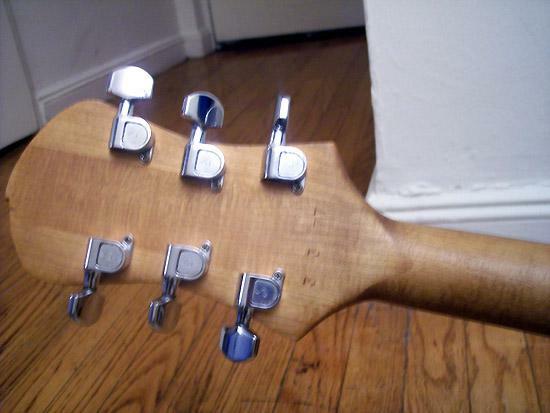 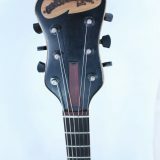 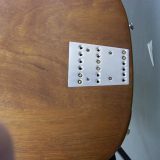 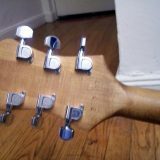 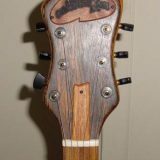 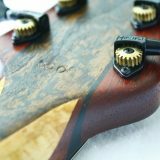 The control plates on the front of the guitar are not original and were later added by another owner. 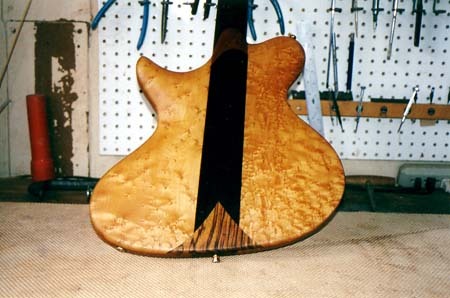 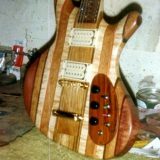 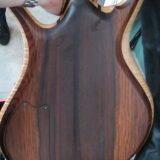 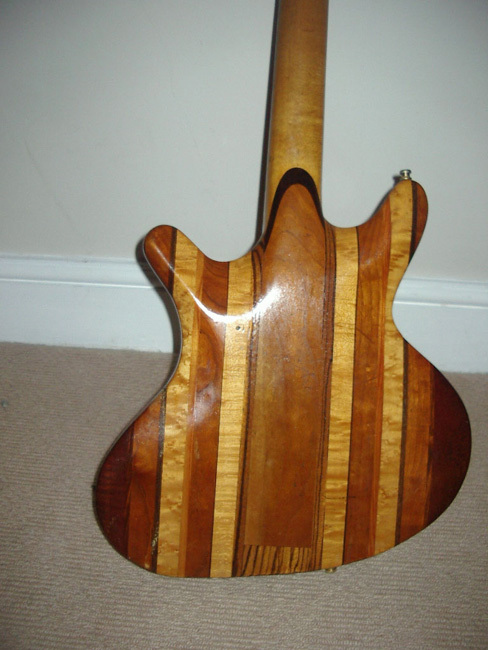 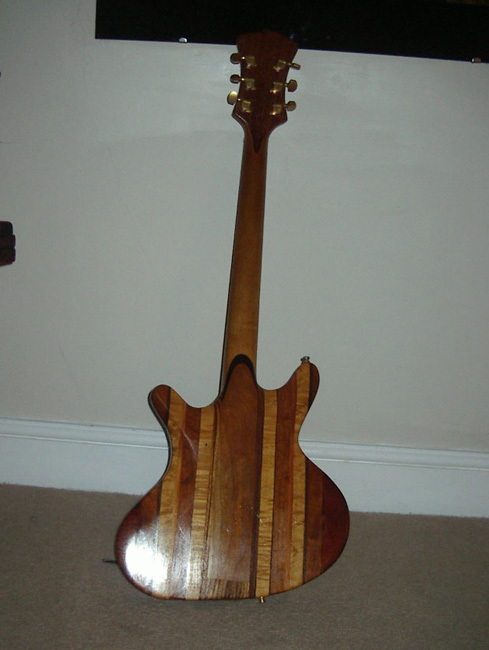 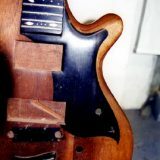 Note the unique Zebrawood triangle inlay on the back of the guitar and the rare body shape. 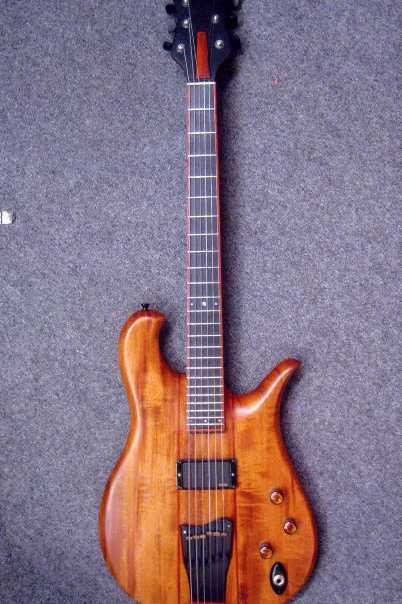 This 6-string guitar is owned by Ivan Rodriguez, with serial #3377. 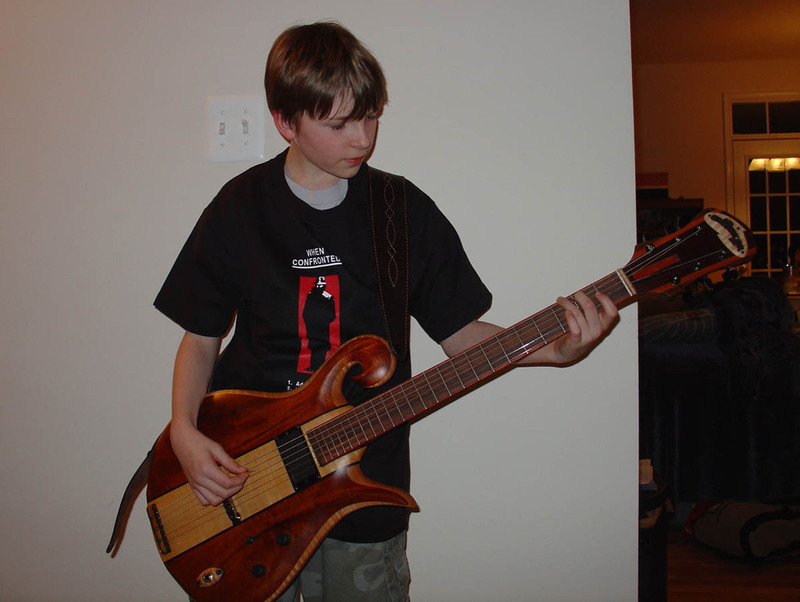 “This was my first real guitar. 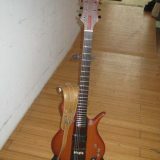 I got her back in 1981 for my 18th birthday at Sam Ash on 48 Street. 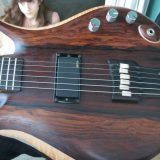 My dad realized how much I enjoyed playing and all the effort I was putting into it. 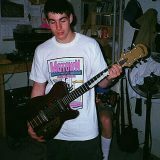 We weren’t exactly rich but he worked a lot of overtime to give me $300 towards a new guitar. 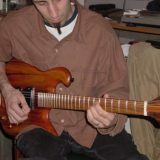 I tried an Ibanez Artist and a Destroyer as well as a BC Rich that day. 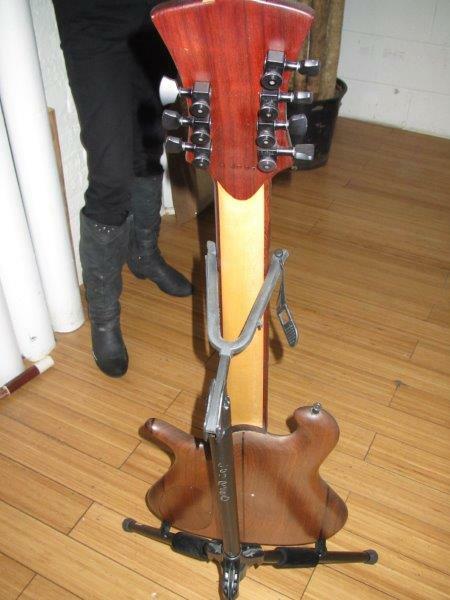 This guitar was in their bargain bin section. 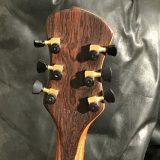 I tried it and my hands as well as ears felt immediately at home. 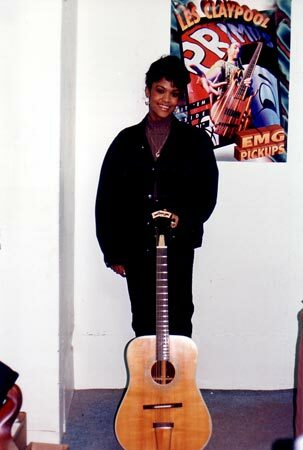 I have really grown to appreciate her over the years.” The neck is made of ebony and the body is either mahogany or walnut. 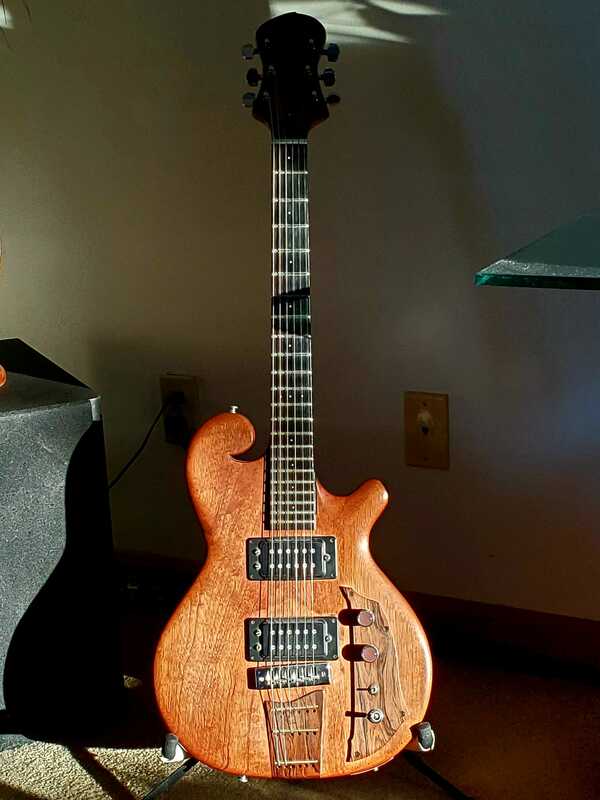 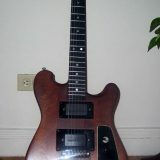 Dan sent in these pics of his 1975 guitar, serial # 111675. 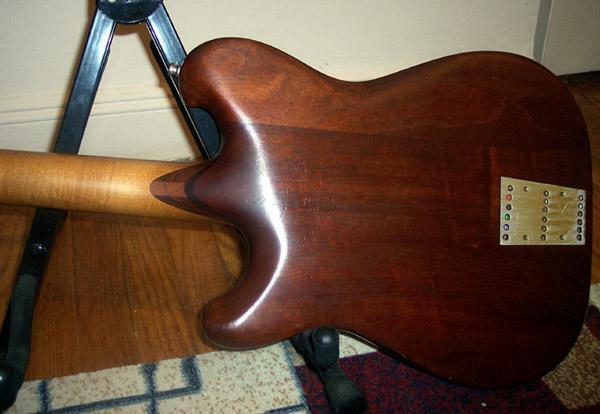 Dan bought the guitar in 1976 from a shop called Gracins on Long Island. 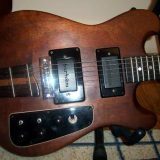 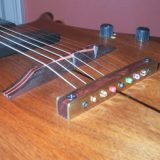 It has 2 pickups, 1 tone & 1 volume pot, a 3-way pick-up selector switch, a pick-up phase selector switch, rosewood fret board, Schaller tuning heads, and a leather nameplate. 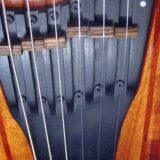 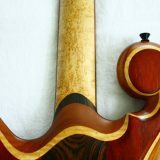 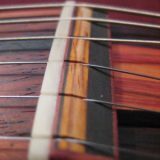 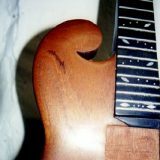 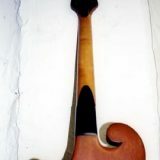 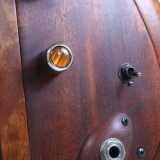 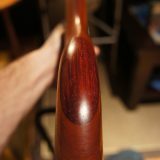 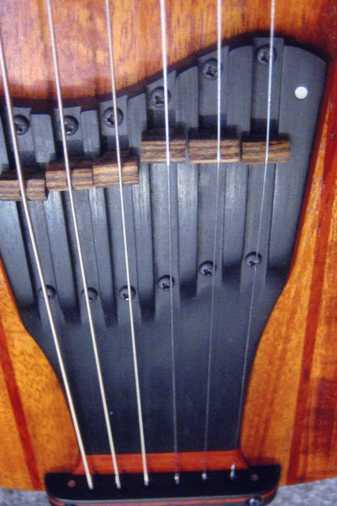 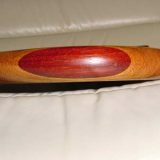 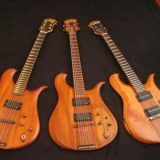 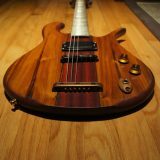 As with most of those early instruments, the body is mahogany. 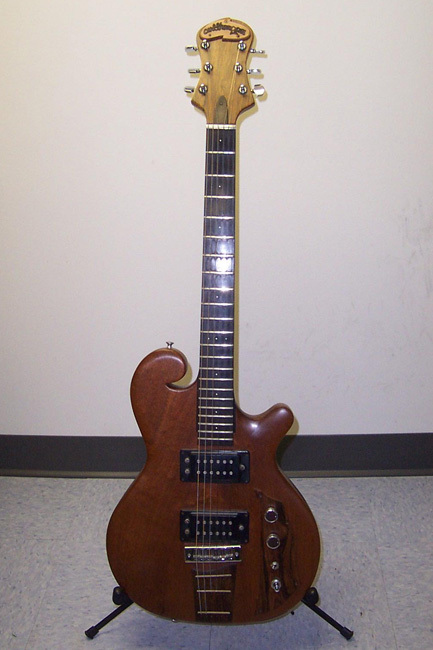 Esko is the proud owner of this 1975 guitar, serial # 81475. 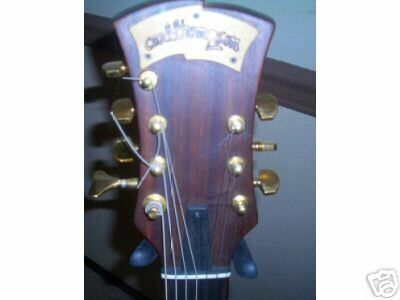 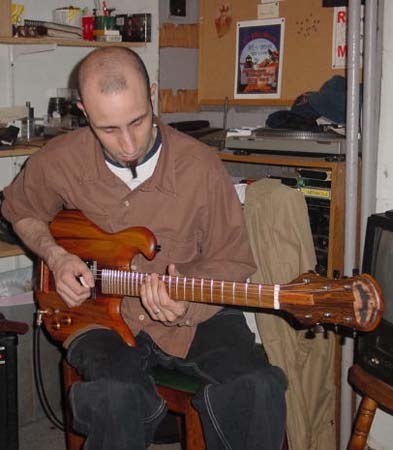 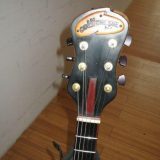 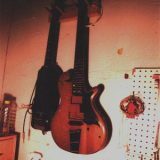 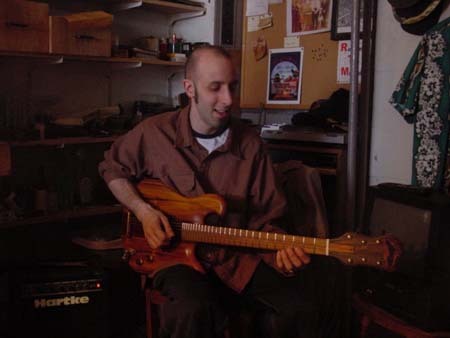 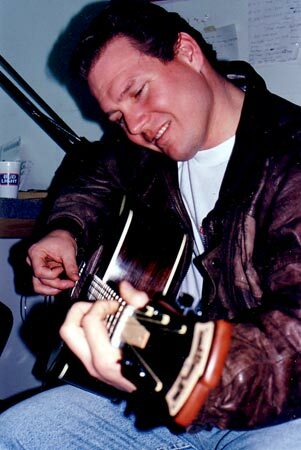 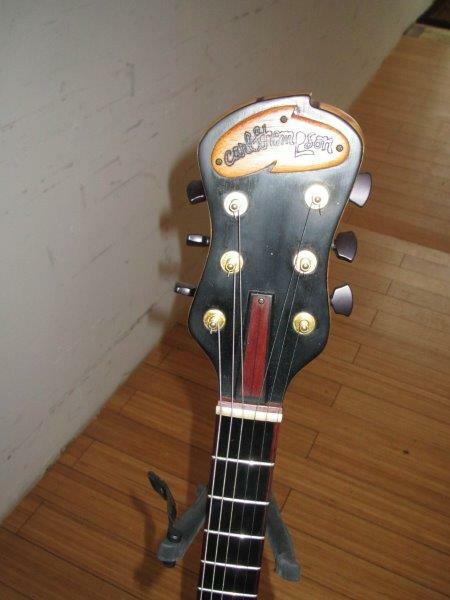 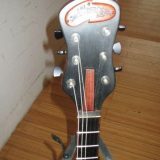 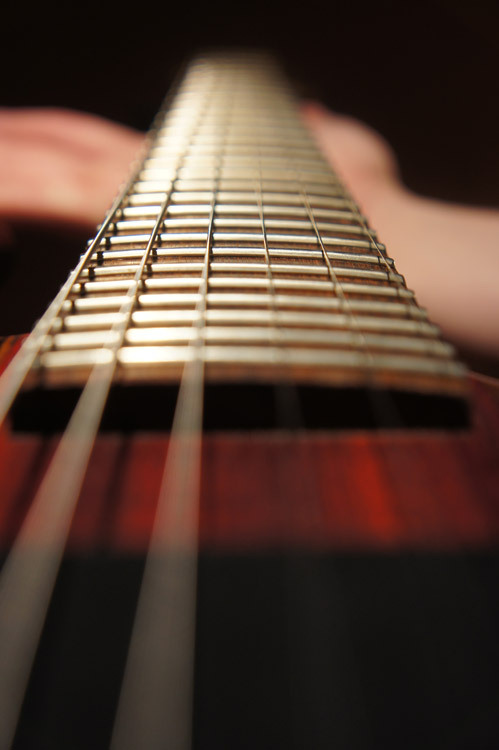 The guitar was purchased at a second hand music store on 48th Street and is the second guitar Carl ever built. 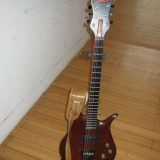 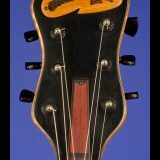 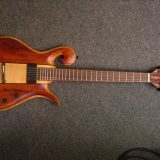 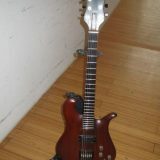 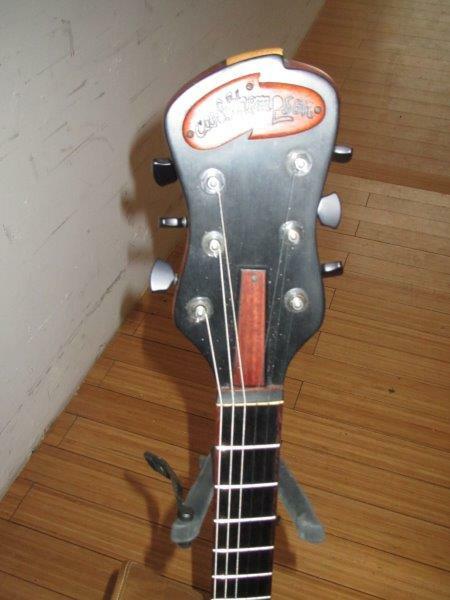 This very early guitar was sold on the page and purchased by David Muntner. 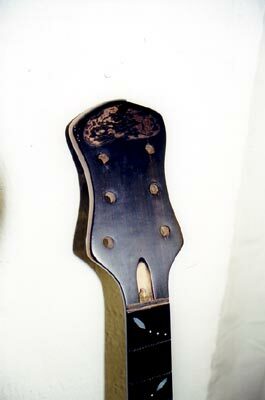 This one has no serial number, although Carl says that this was not uncommon on the first few instruments. 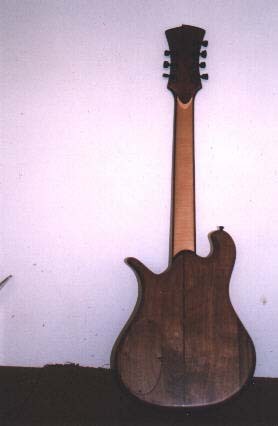 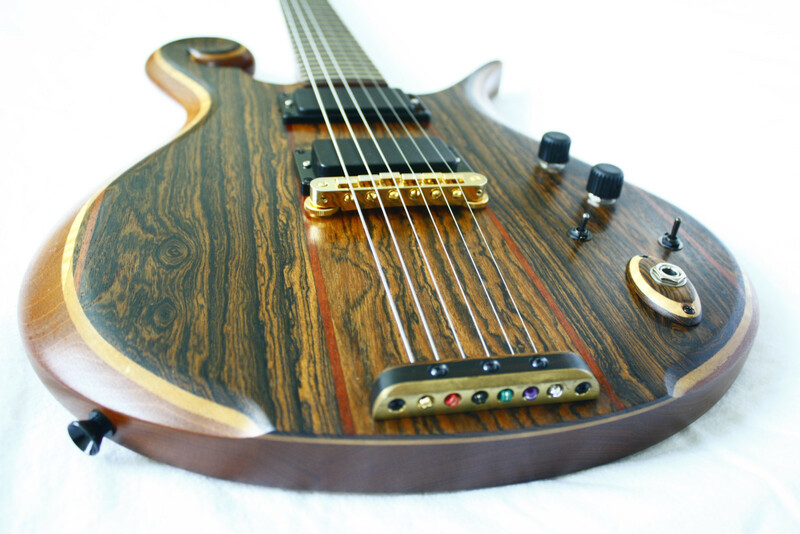 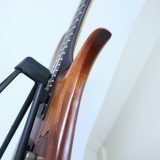 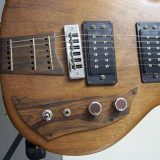 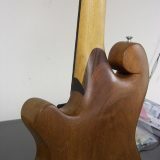 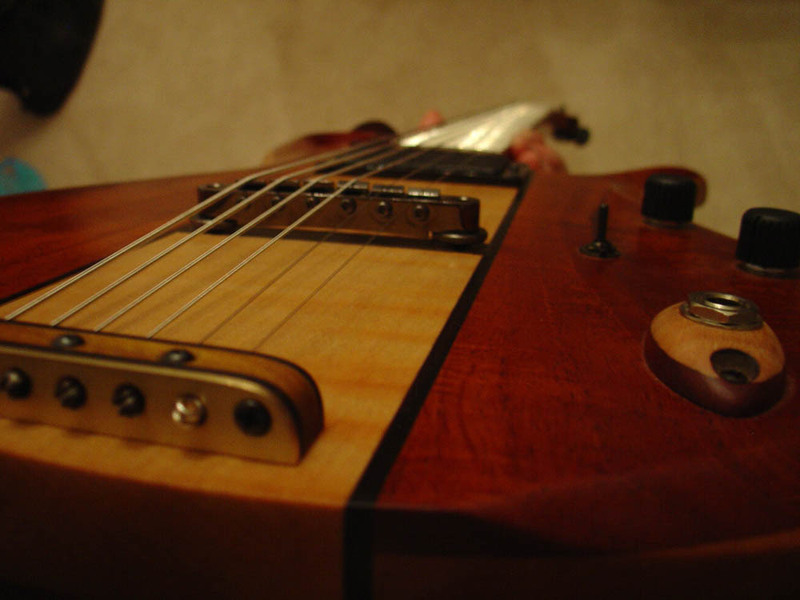 The body is walnut with a maple neck, ebony fingerboard and aluminum nut. 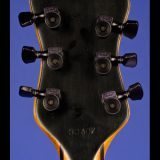 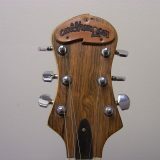 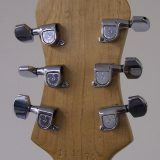 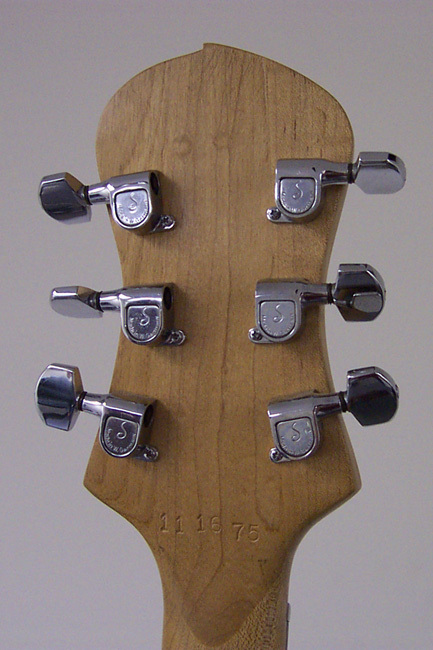 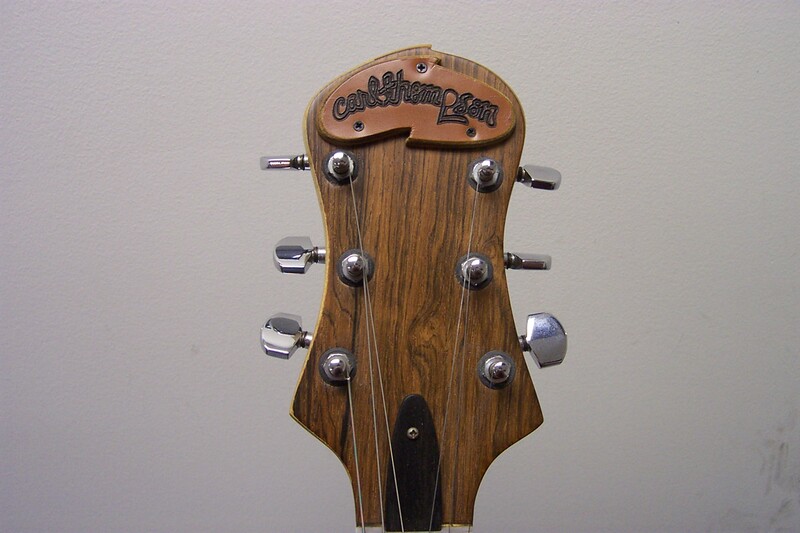 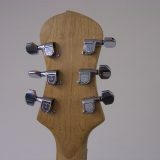 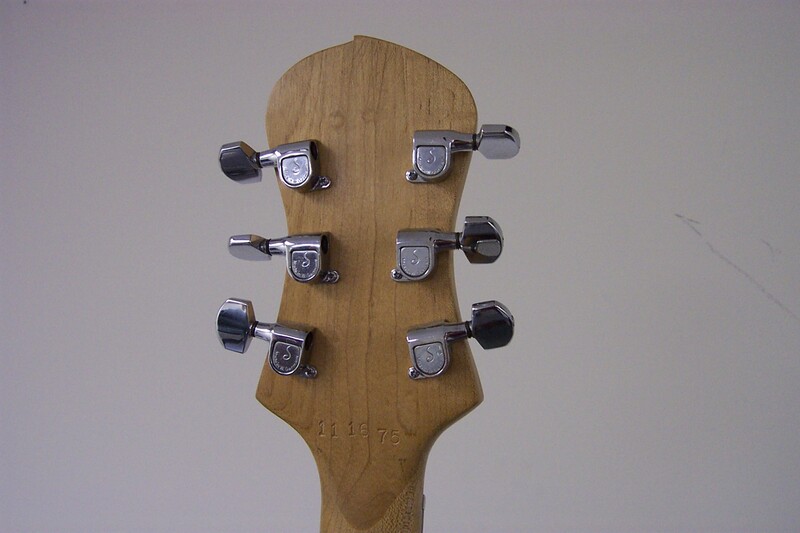 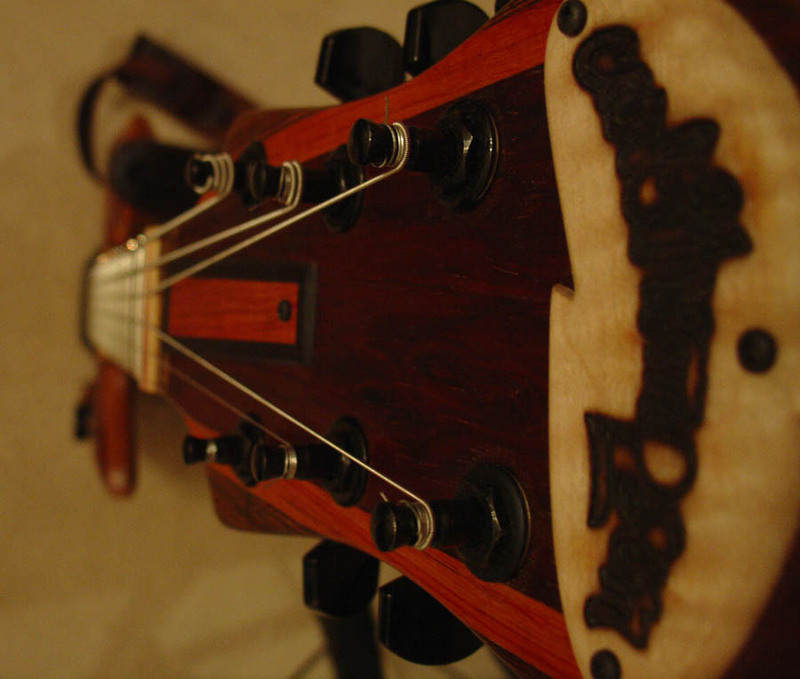 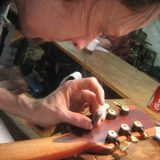 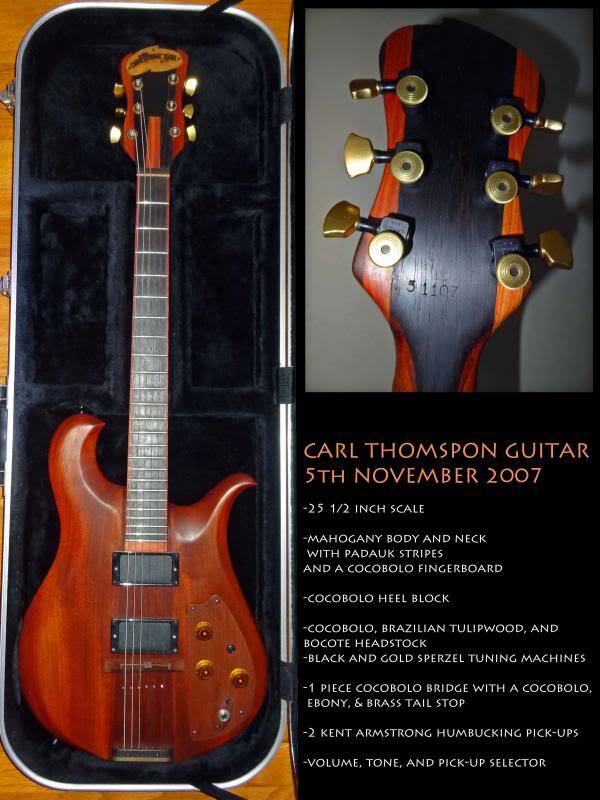 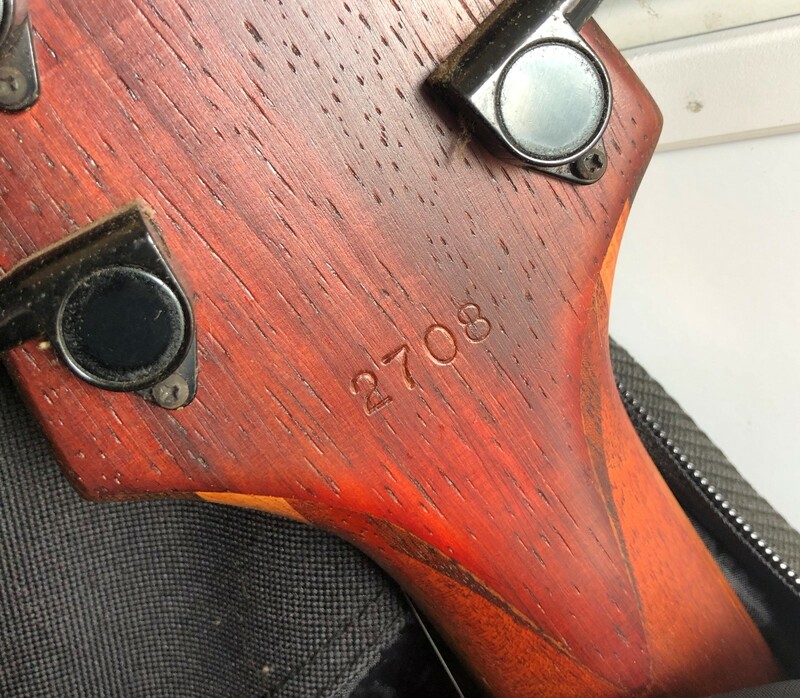 The Carl Thompson logo is made of leather on the headstock, which was only done on the first few instruments. 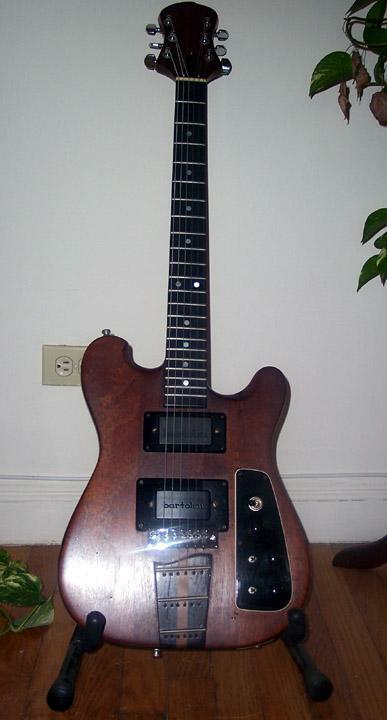 The bridge pickup is a Dimarzio super distortion humbucker and the neck pickup is a Schaller single coil. 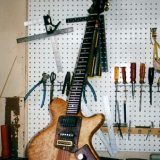 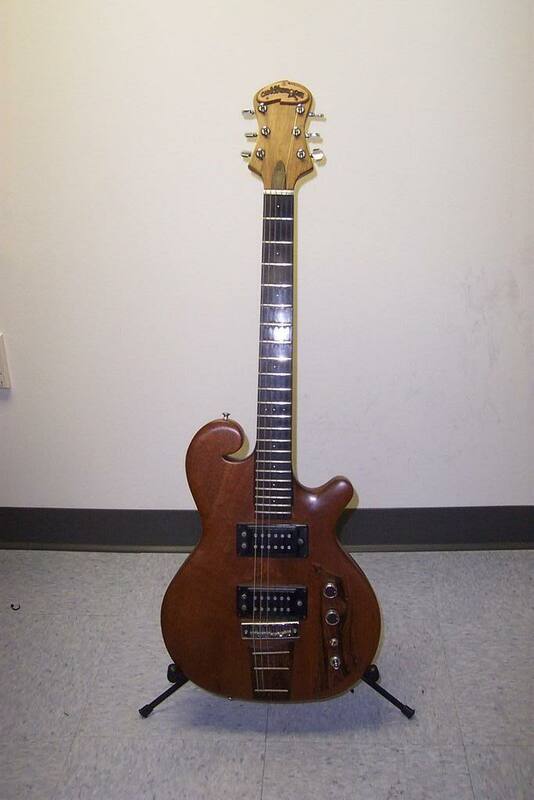 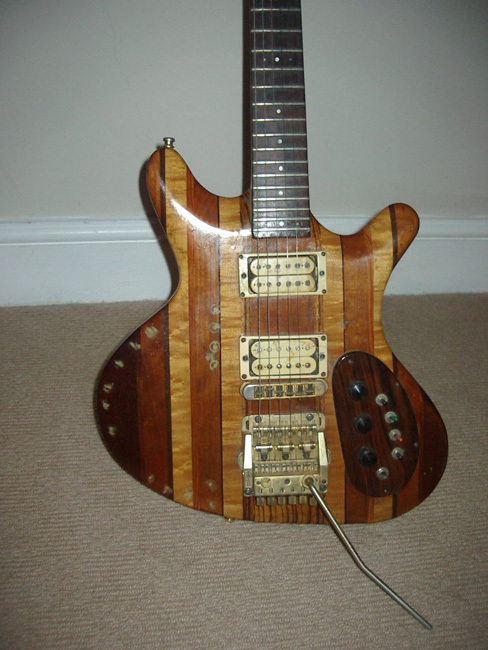 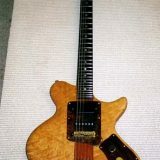 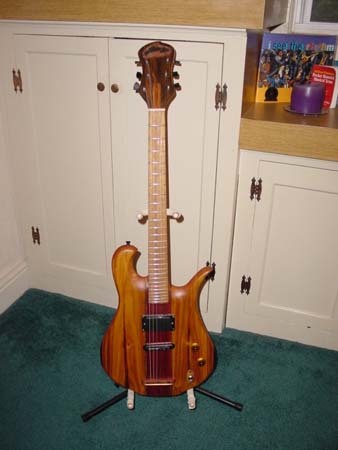 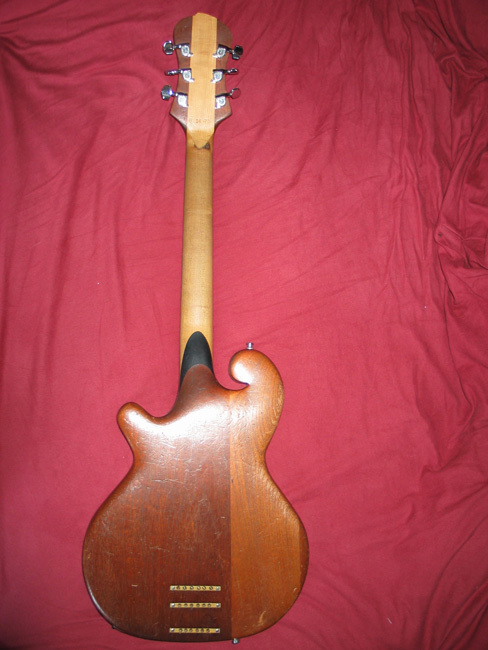 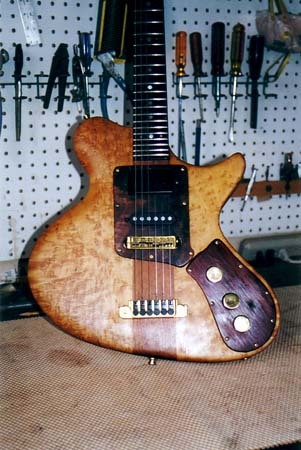 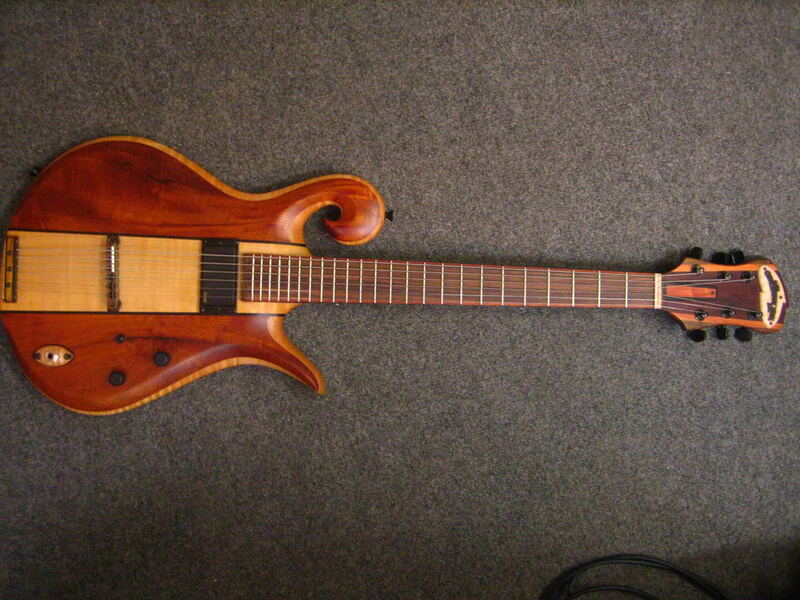 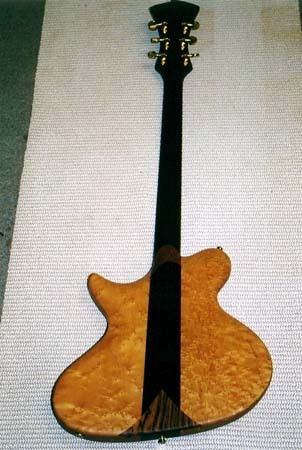 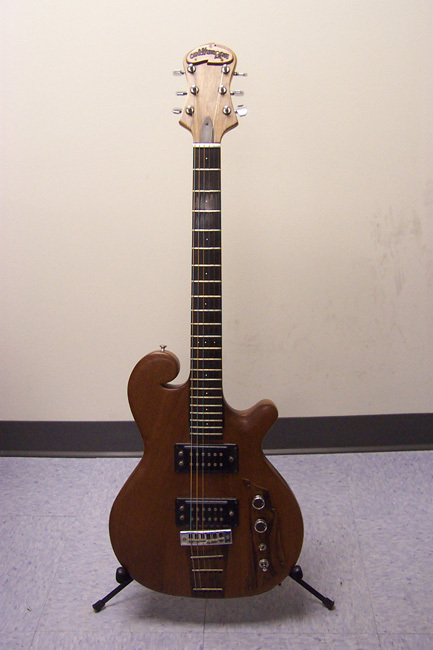 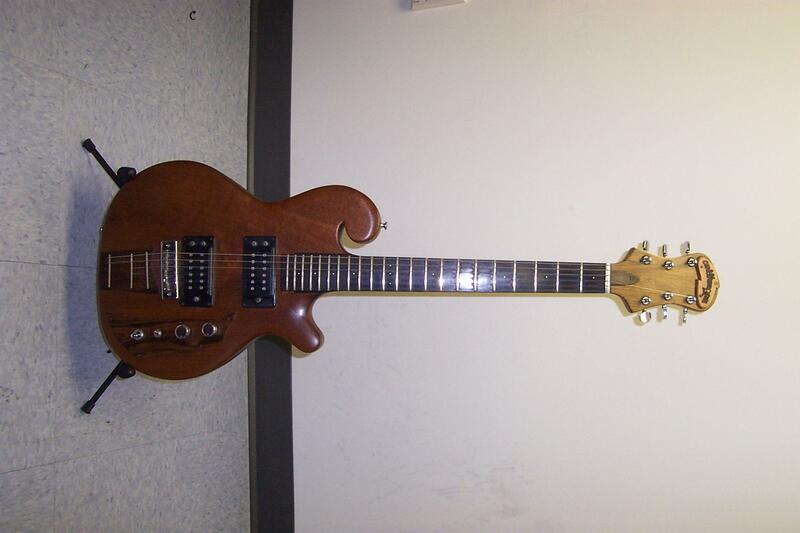 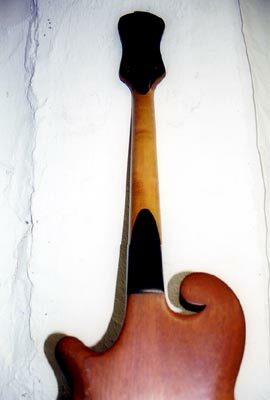 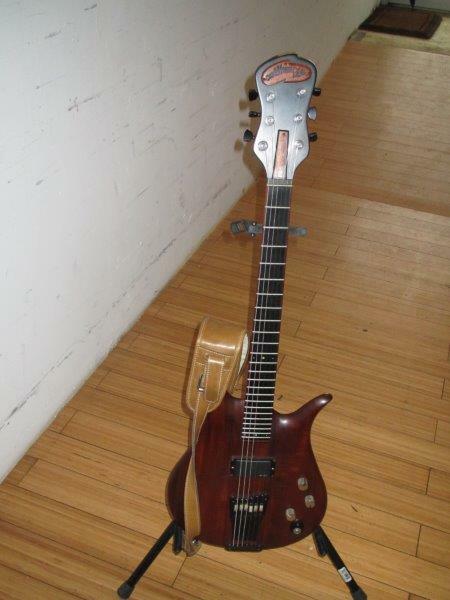 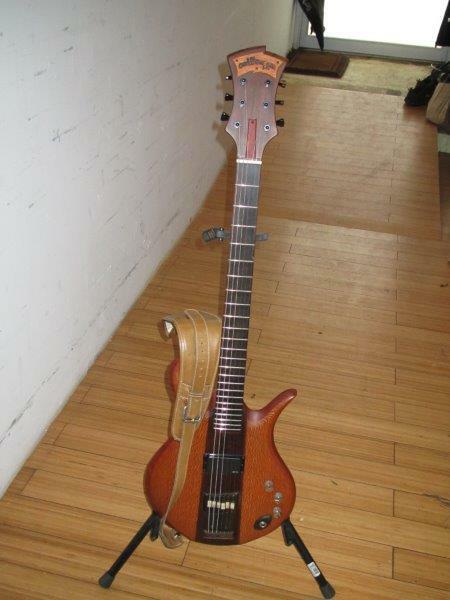 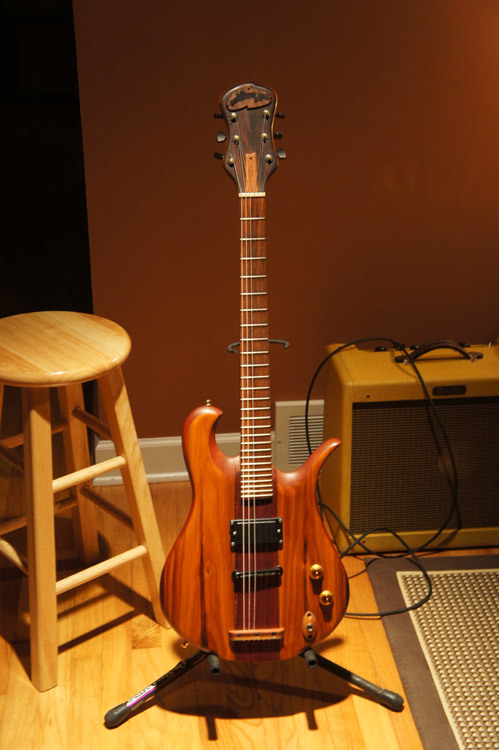 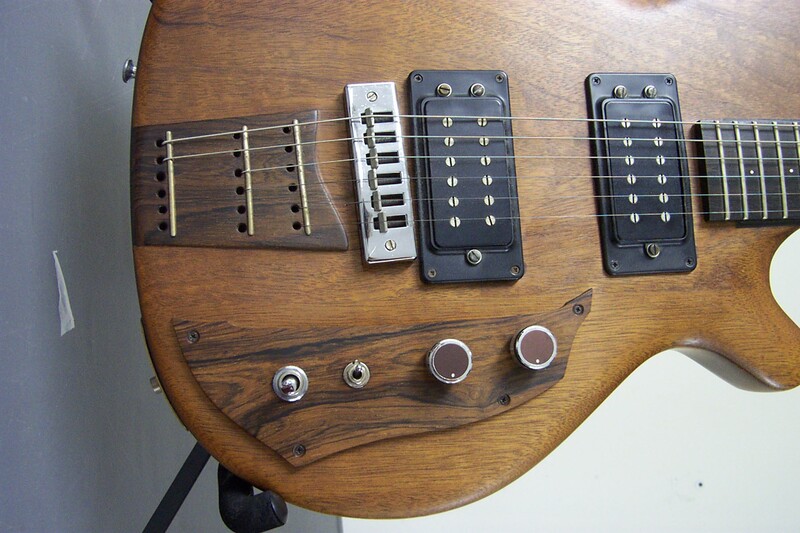 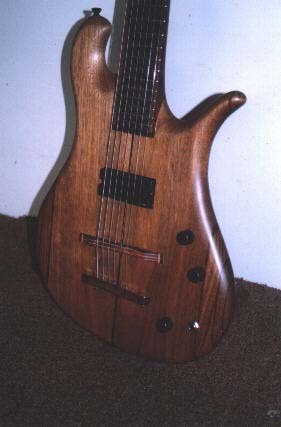 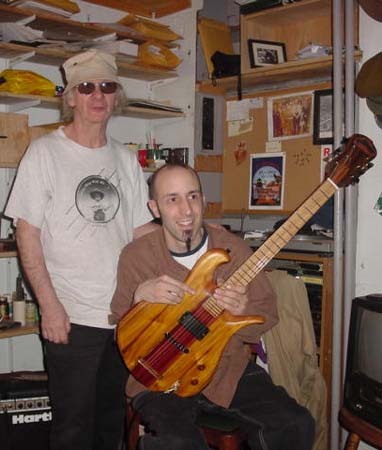 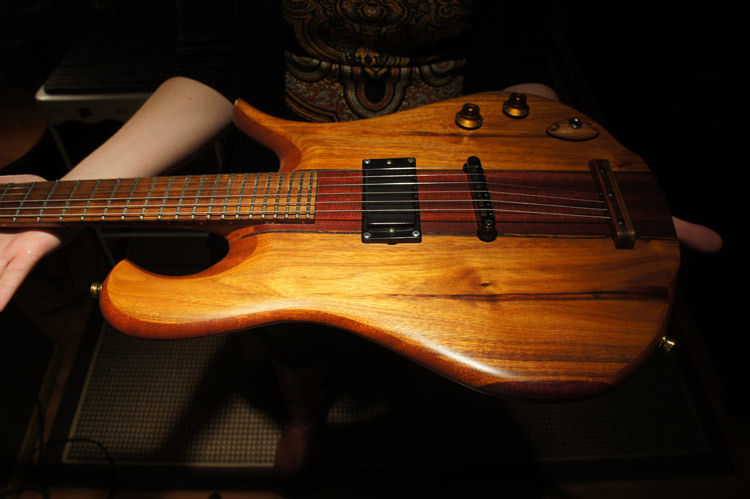 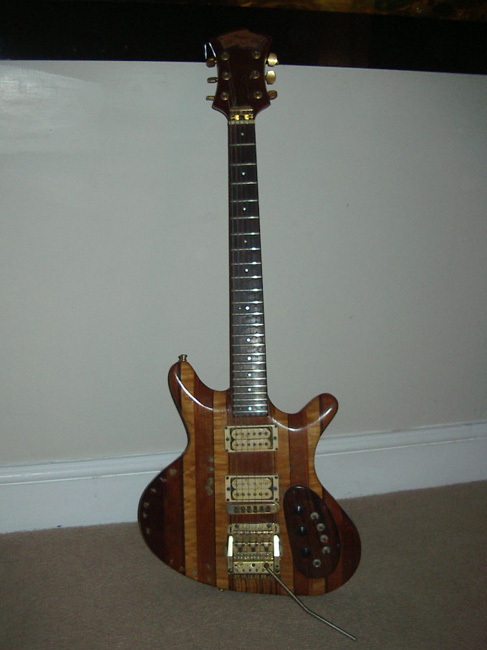 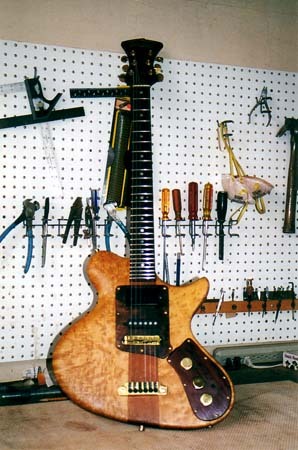 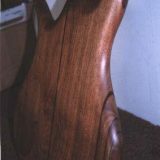 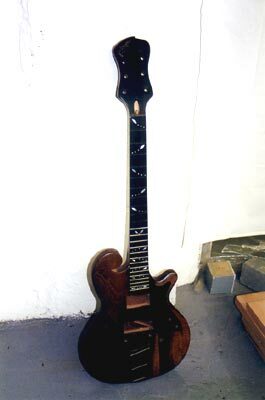 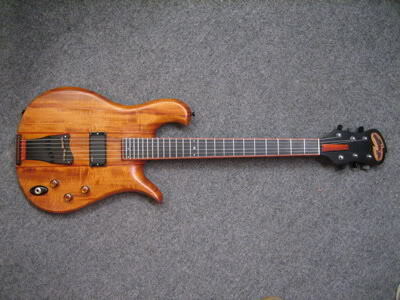 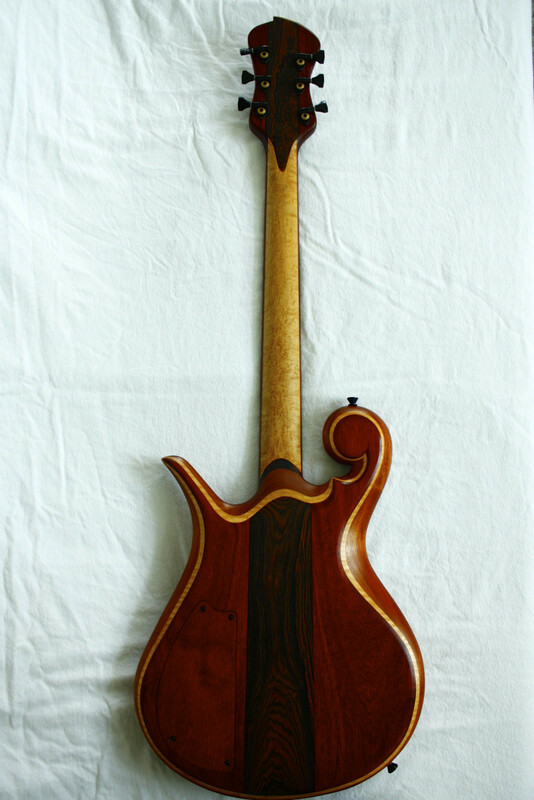 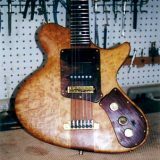 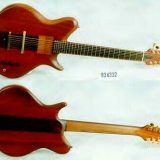 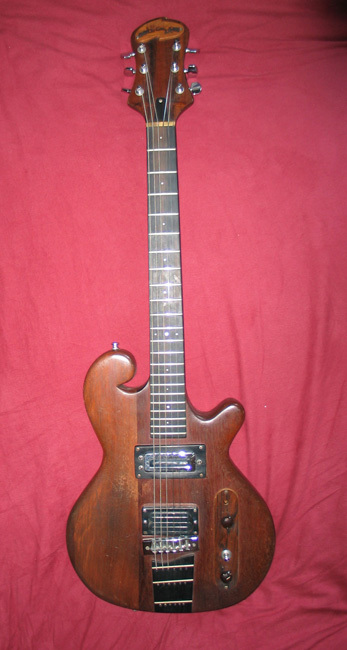 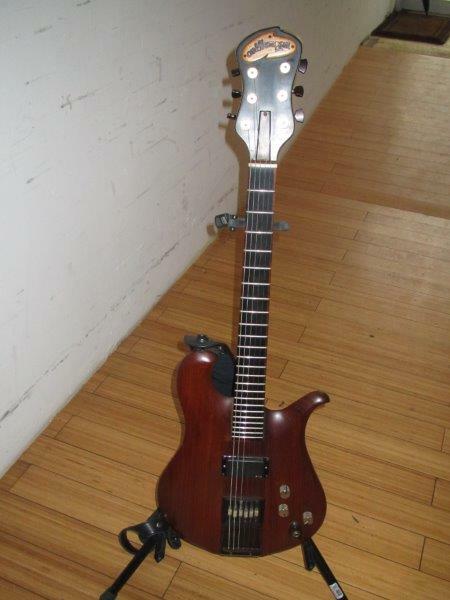 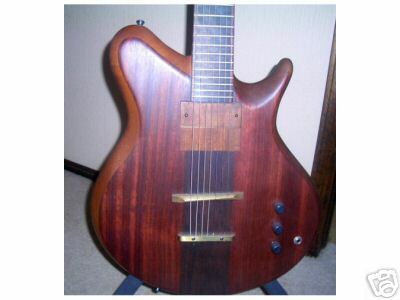 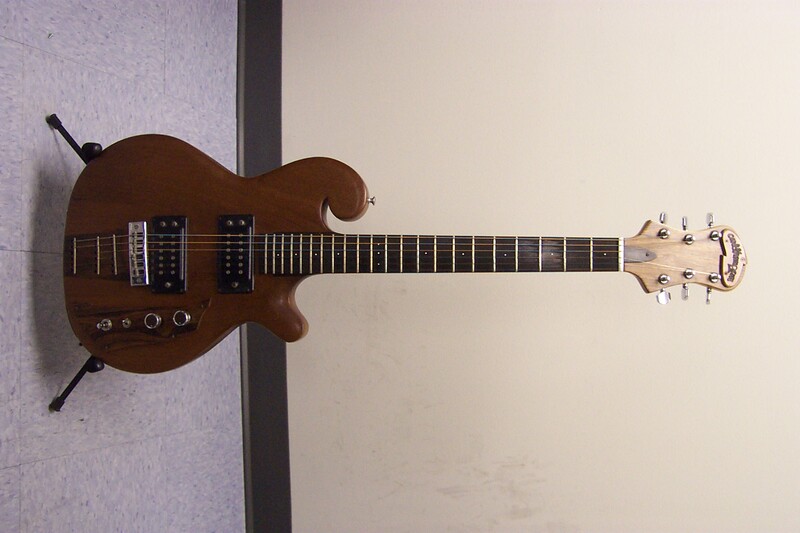 The first Carl Thompson guitar, made in 1974. 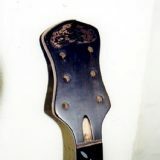 Check out the inlayed pick guard, the early scroll design and the neck inlays. 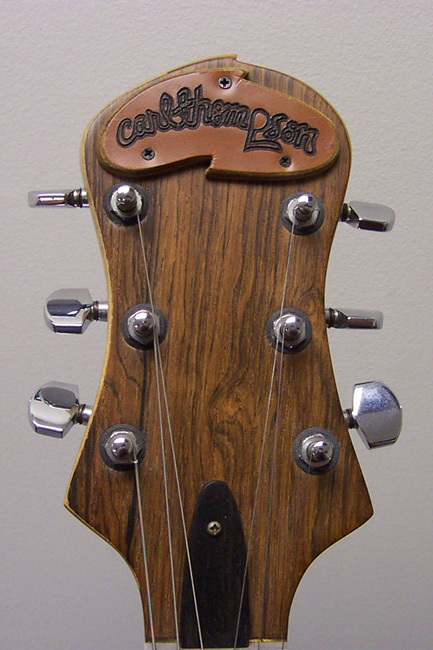 It also has a leather headstock top. 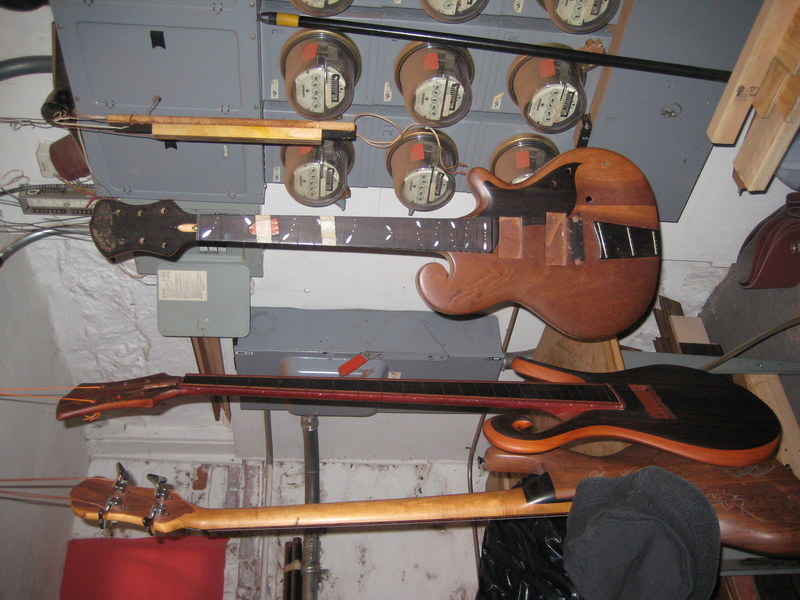 The black guitar is was built by Carl’s dad built in 1934.